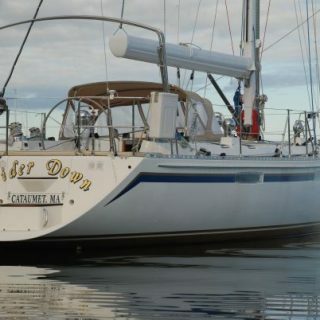 EIDER DOWN represents a great opportunity to own a proven blue water cruising boat, built and maintained to the highest standards and set up to be easy to handle and take care of. 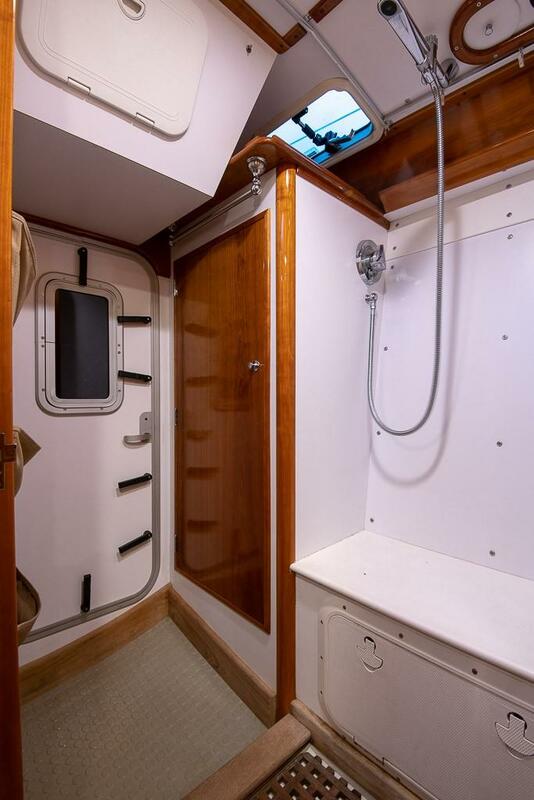 With two separate cabins with double berths (as well as the settees in the main cabin), the large head with separate shower area and abundant storage and tankage, she is perfect for family and friends for extended cruising. 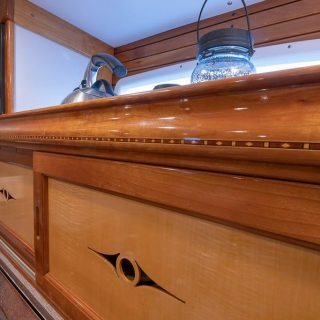 EIDER DOWN is an exceptional vessel, combining one of the best Chuck Paine designs with the fiberglass skills of Morris Yachts and the talents of an extremely detail oriented owner whose company specializes in high-end woodworking. 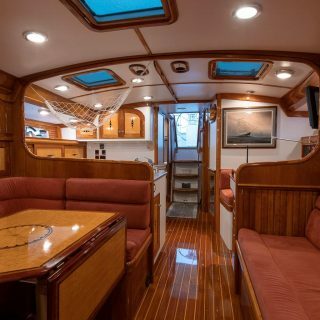 The hull and deck were built by Morris in 2001, shortly after the purchase of Able Yachts and using the molds from the well-respected Apogee 50. 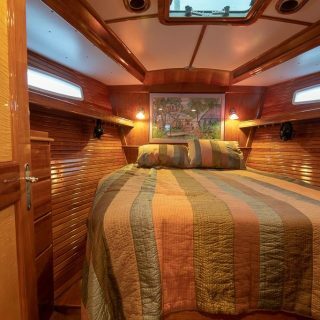 The owner, a highly skilled craftsman who had previously built out a Hinckley SW42, meticulously finished off the boat over the next three years and the boat was finished in 2004. 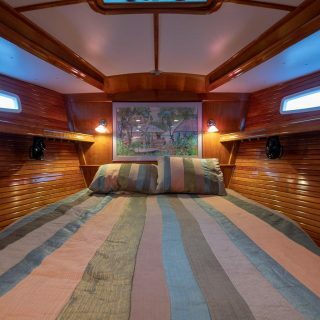 Imagine a boat that was built personally by a boat builder with no time constraints, and every square inch inspected at length by the owner and then kept in Bristol condition. 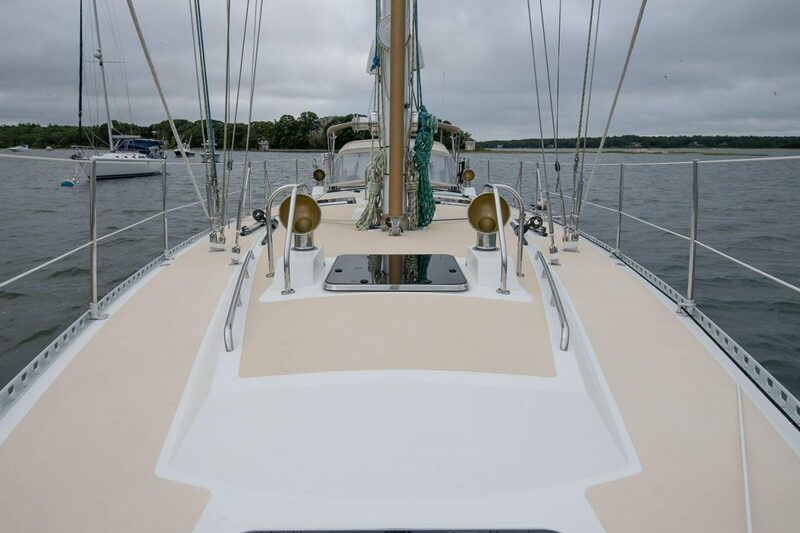 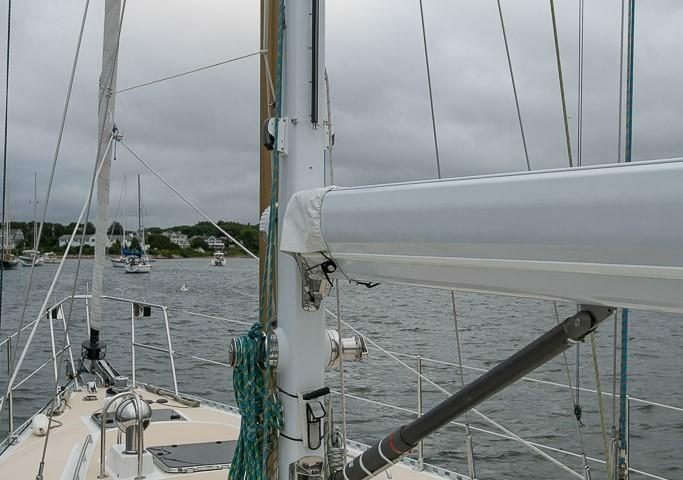 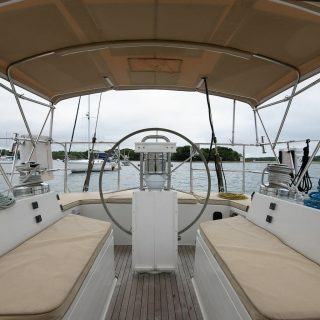 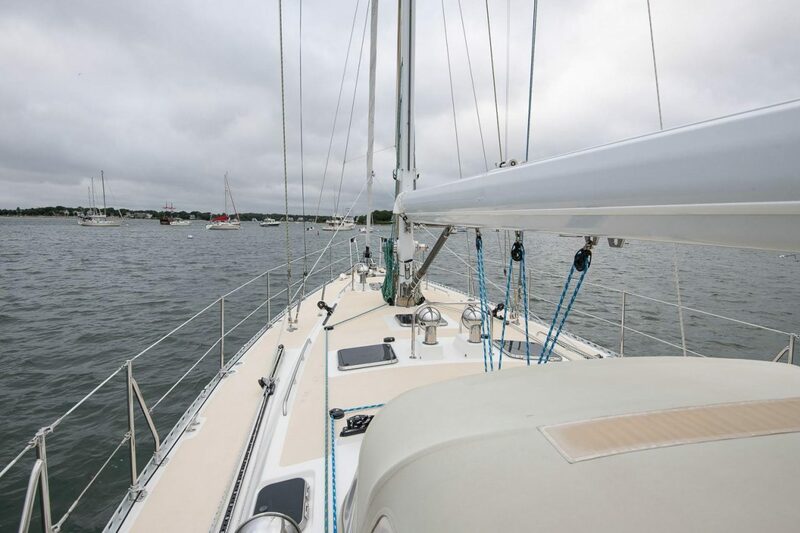 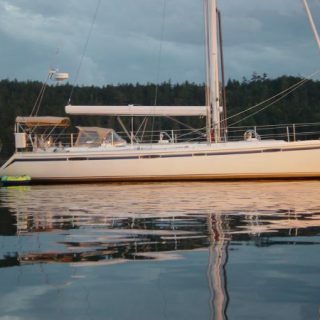 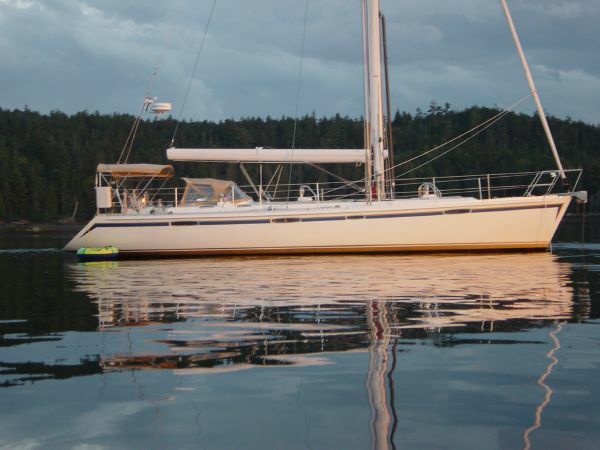 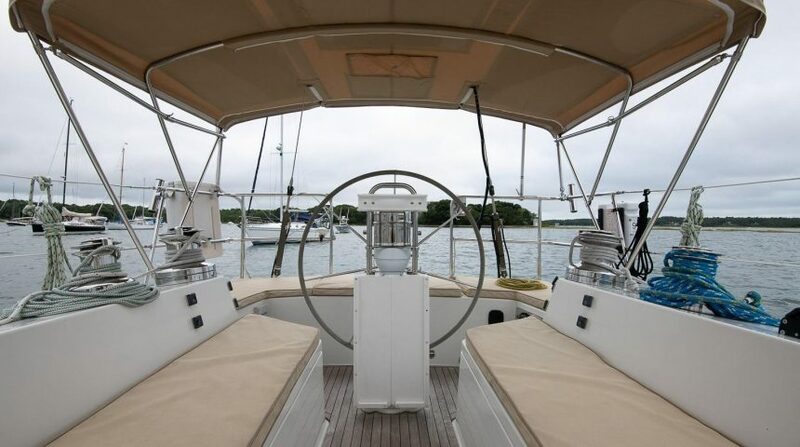 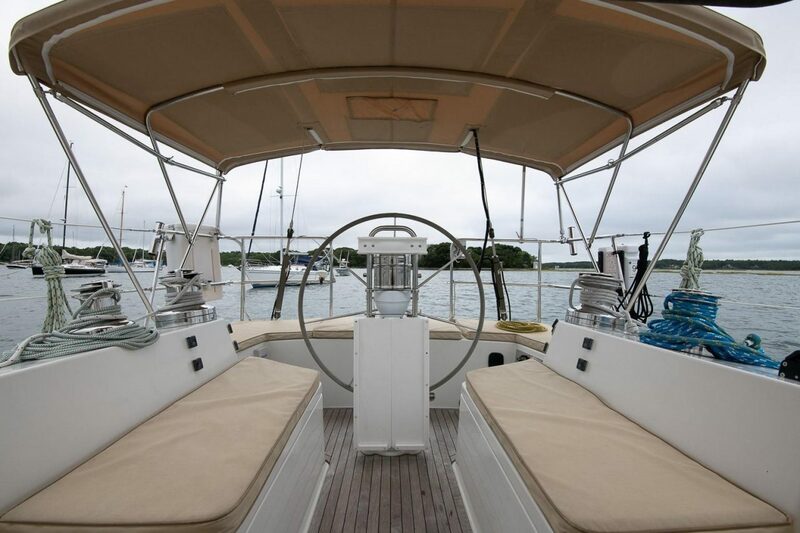 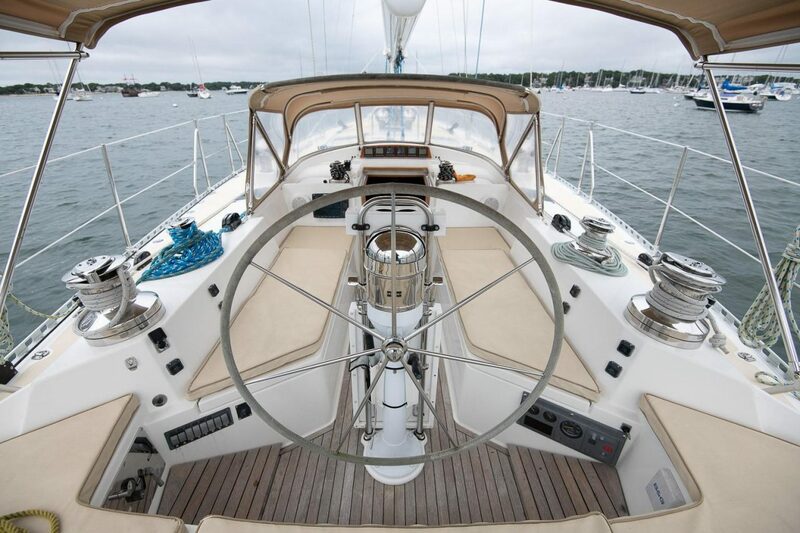 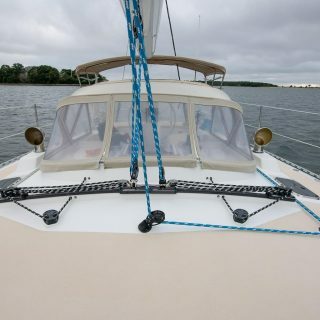 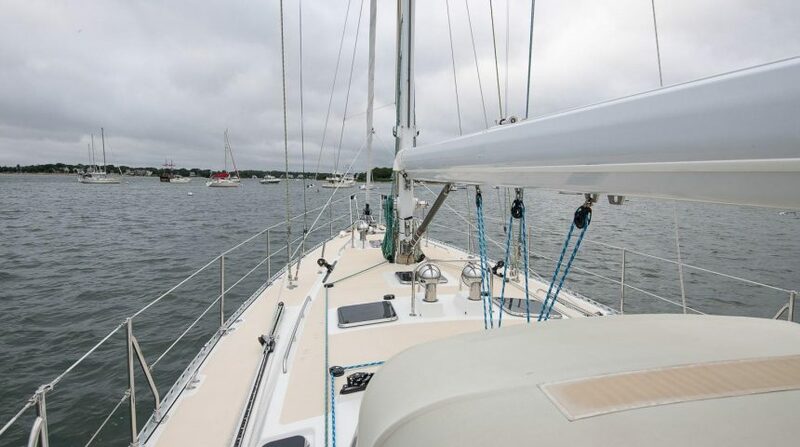 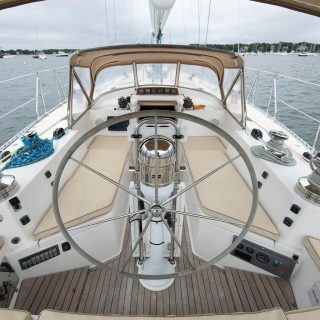 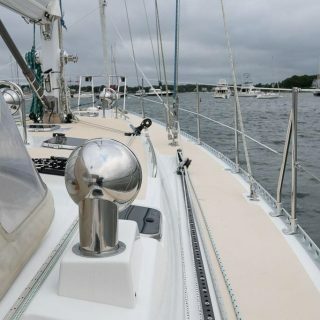 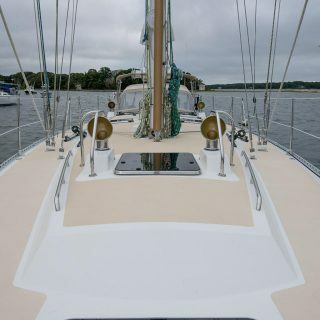 With her Leisurefurl boom, electric winches and deck layout she is easily sailed shorthanded for either an afternoon sail or a blue water cruise. 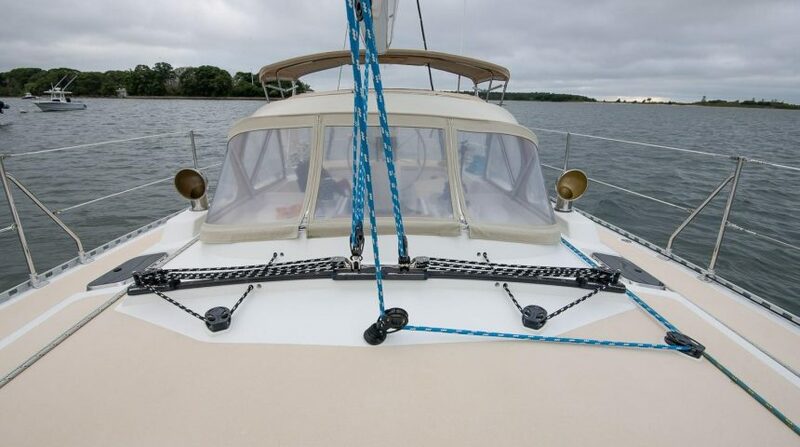 Composite hull with foam core, Vinylester resin and Kevlar hybrid laminate layer in both inner and outer skins. 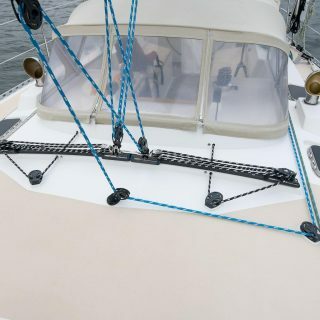 Deck foam cored and laid up with Vinylester resin. 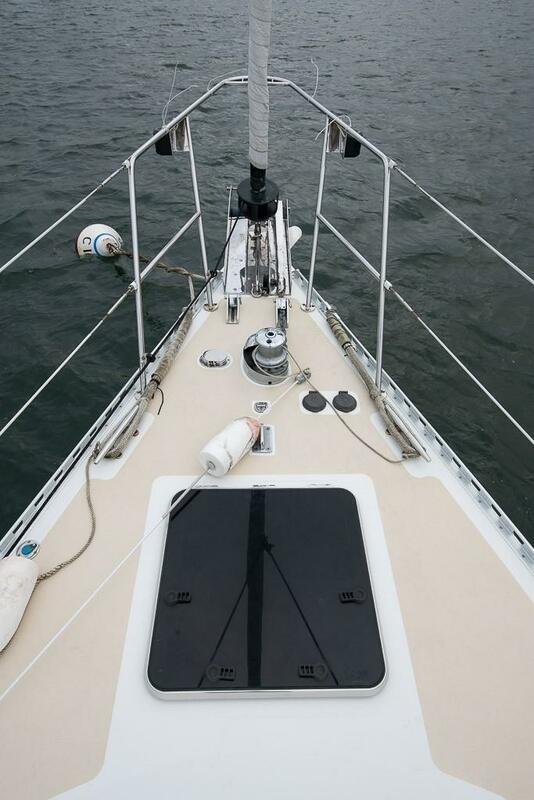 Carbon fiber spade rudder with 5" carbon fiber post and upper and lower self-aligning bearings. 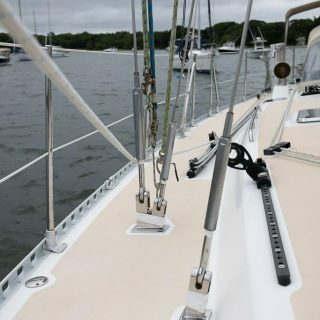 External ballast lead keel with stainless steel keel bolts. 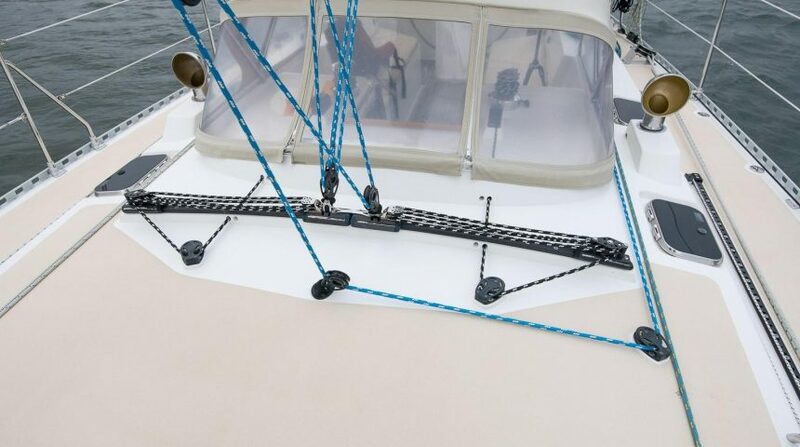 White Awlgrip decks with tan non-skid. 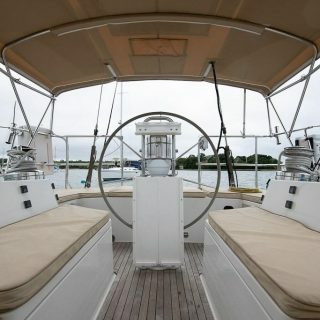 Sugar scoop stern with steps and boarding gate for easy access to the water and dinghy. 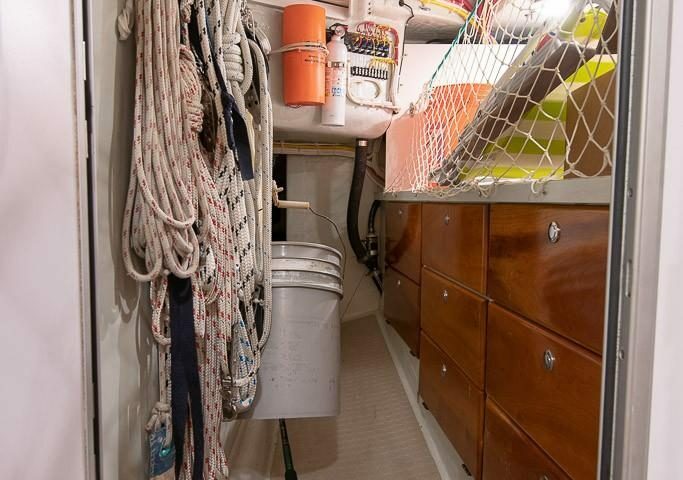 Integrated storage for dinghy gas in bottom step of sugar scoop. 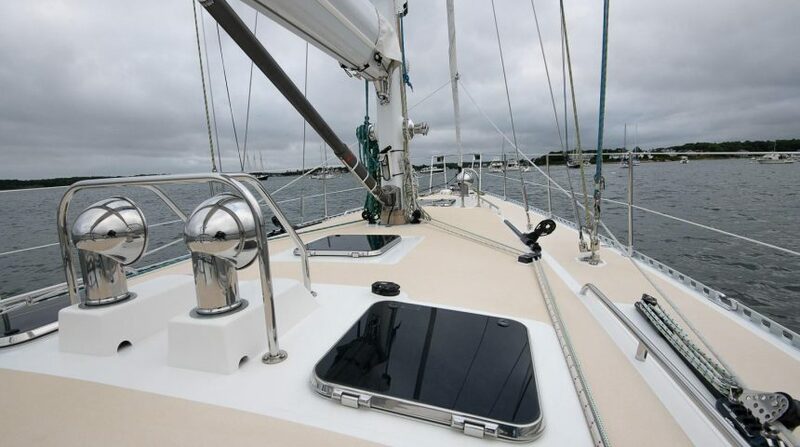 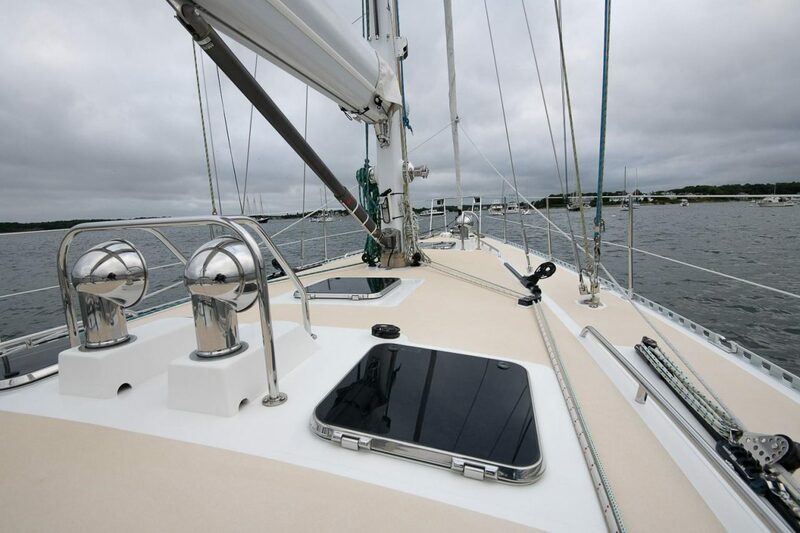 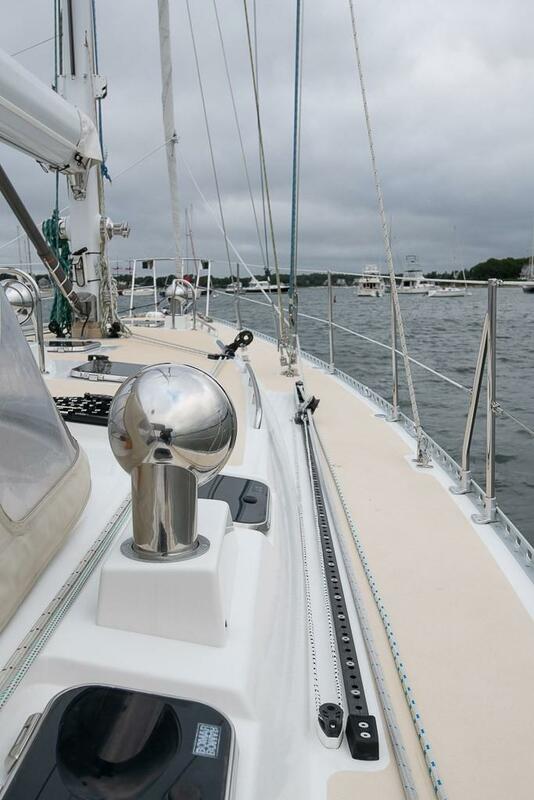 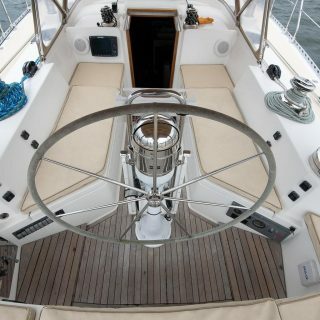 The deck is designed and laid out for safety, simplicity in sail handling and comfort. 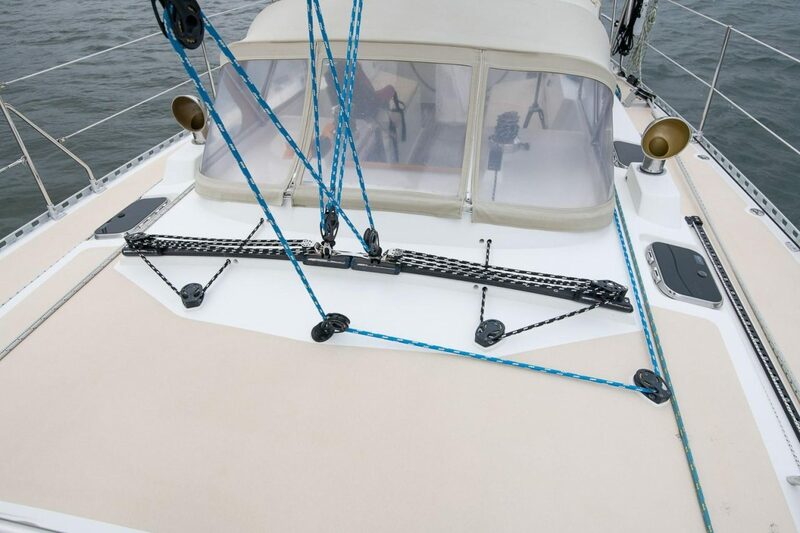 Control lines are led aft to the cockpit and wide, uncluttered side decks allow easy movement around the boat and the painted on non-skid provides secure footing underway. 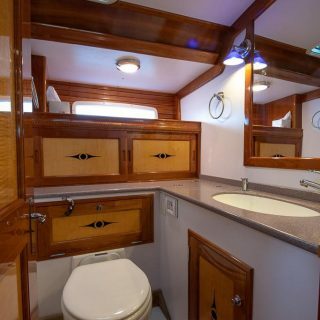 The use of wood has been minimized on the exterior for simple maintenance. 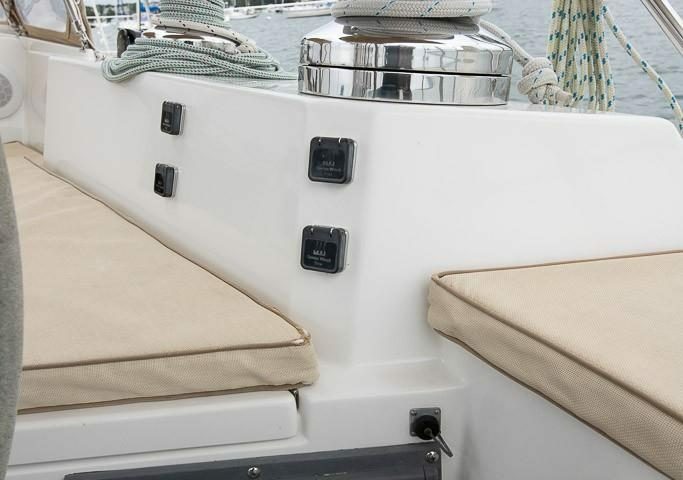 (9) Bomar stainless steel deck hatches. 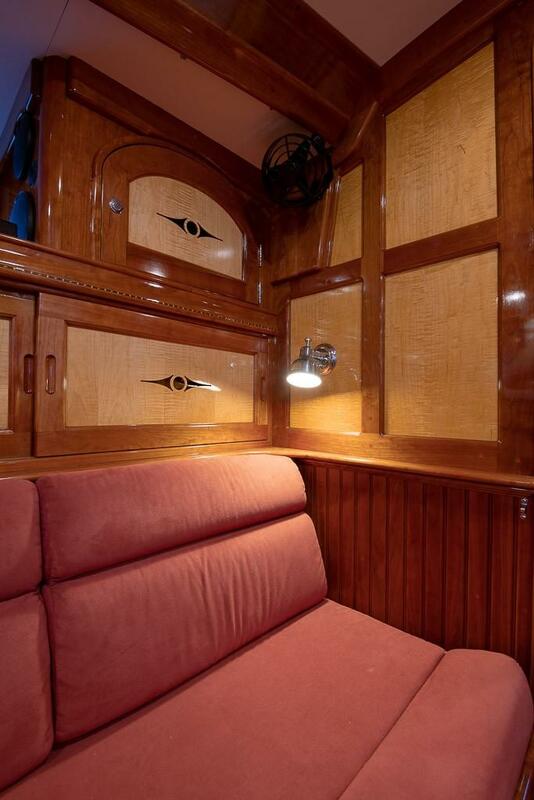 (6) Fiberglass dorade boxes with chromed cowlings and stainless steel guards on four forward dorades. 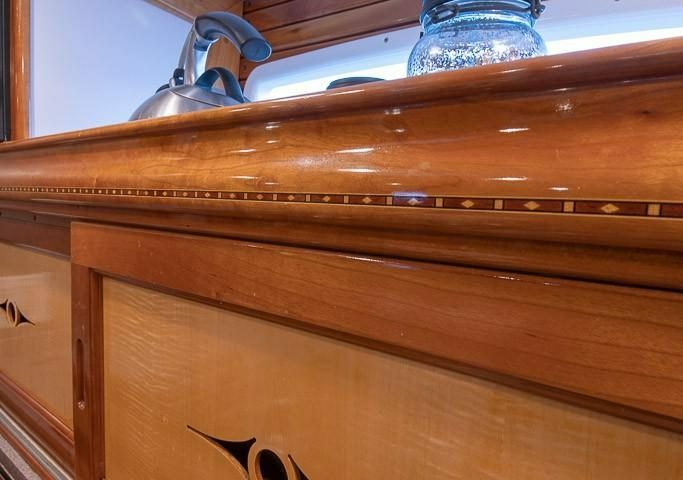 SS cabin top hand rails. 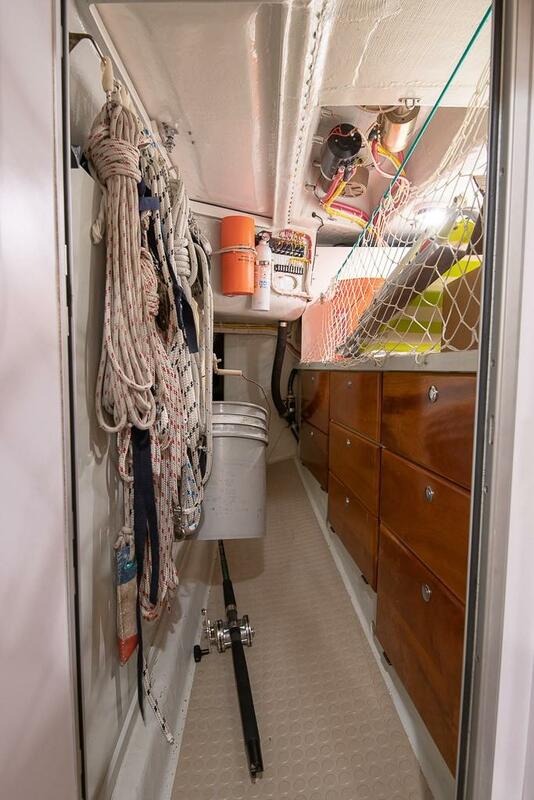 Large forepeak storage locker accessed from the deck for line/fender/sail storage. 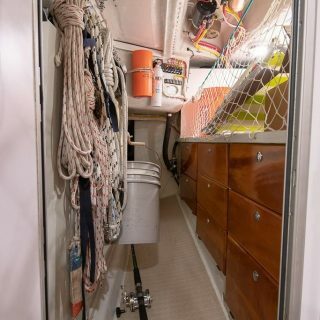 Separate partition for chain storage. 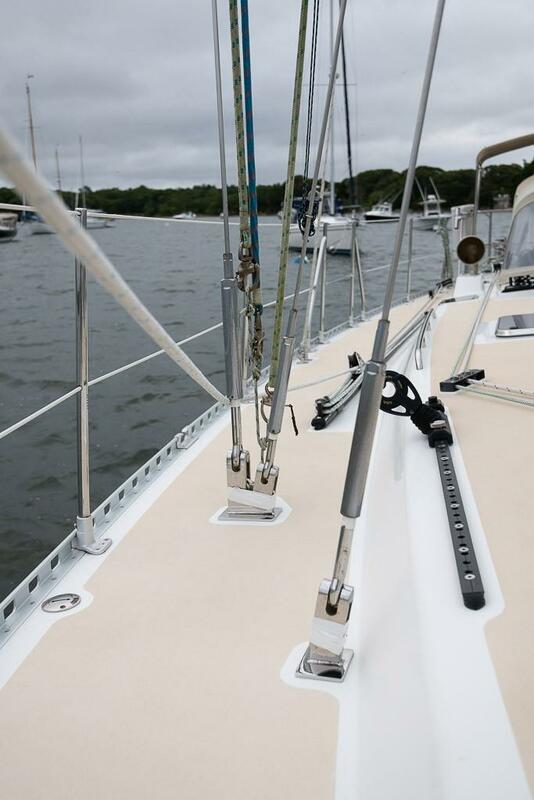 Chain stoppers for primary and secondary anchors. 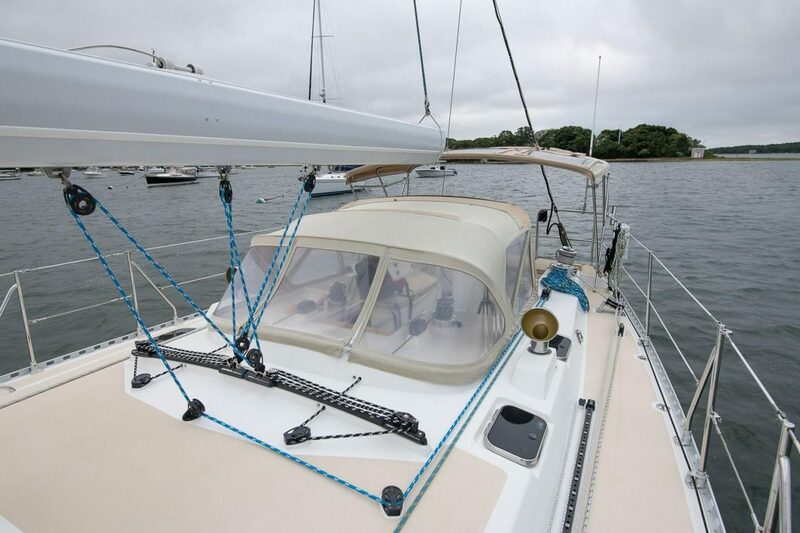 Deck mounted Harken big boat traveler. 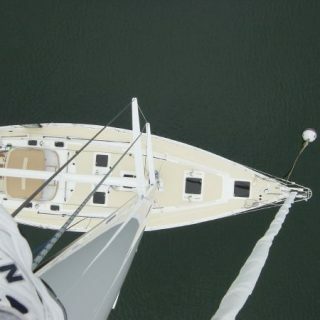 Main sheet, main halyard, main furling line, topping lift and genoa/jib sheets run back to the helm. 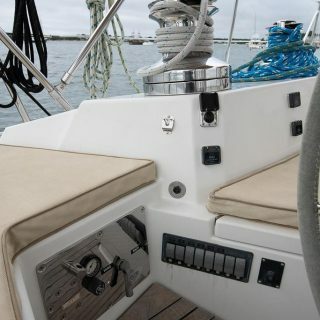 The large T-shaped cockpit is laid out for easy access the electric winches from the helm or settees with all control lines for main and genoa led aft. 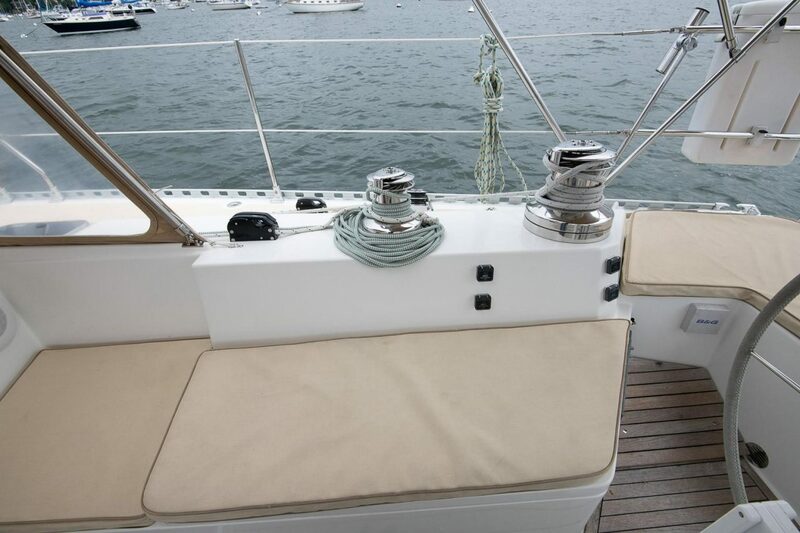 A step down under the dodger provides additional protection under way and an easier transition down the companionway. 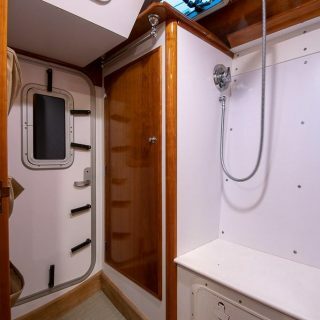 Access to machinery space, propane locker and lazerette spaces under cockpit seats. 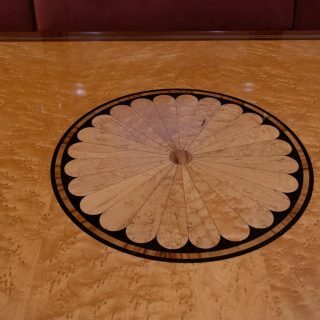 SS wheel with elkhide cover. 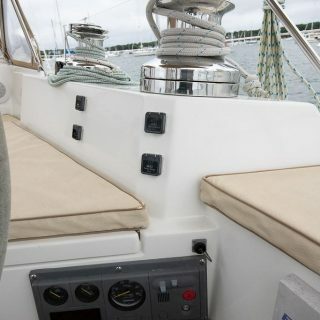 Edson pedestal with separate throttle and gear controls. 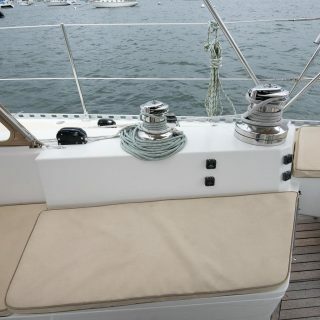 Folding cockpit table mounted to pedestal guard. 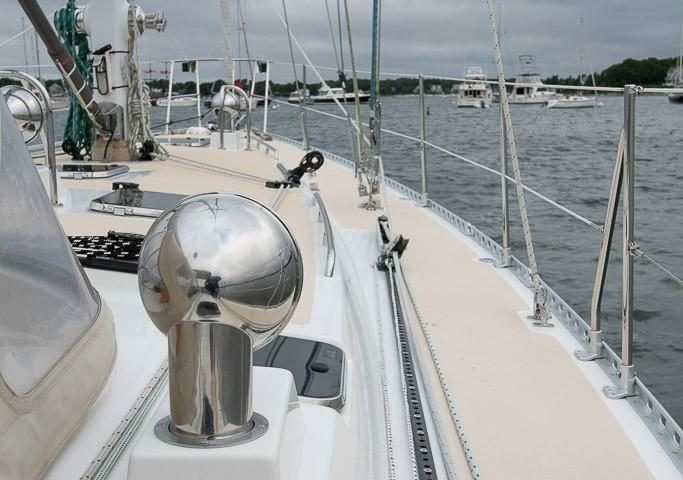 Welded handrail on aft end of dodge with elkhide cover. 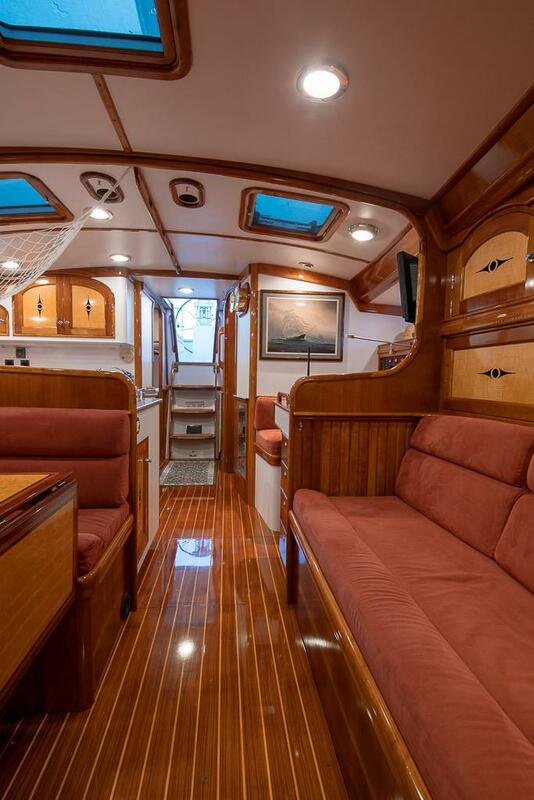 Eider Down’s interior is extremely spacious and well appointed. 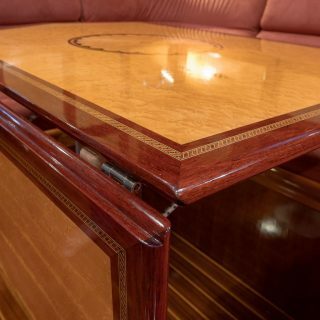 She is finished in exquisite detail with contrasting cherry and curly maple and high gloss varnish. 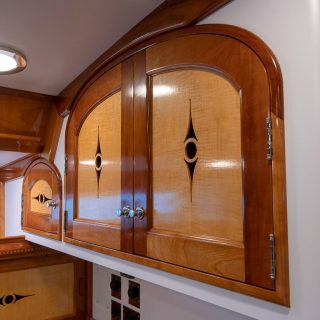 The custom cabinetry incorporates beautiful details like the ornate vents cut into each storage door and intricate inlays. 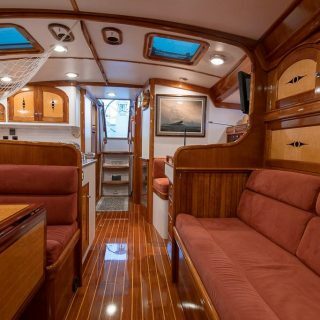 The cabin sole is traditional teak and holly and the overall effect is a rich, elegant interior that is both functional and attractive without being over the top. 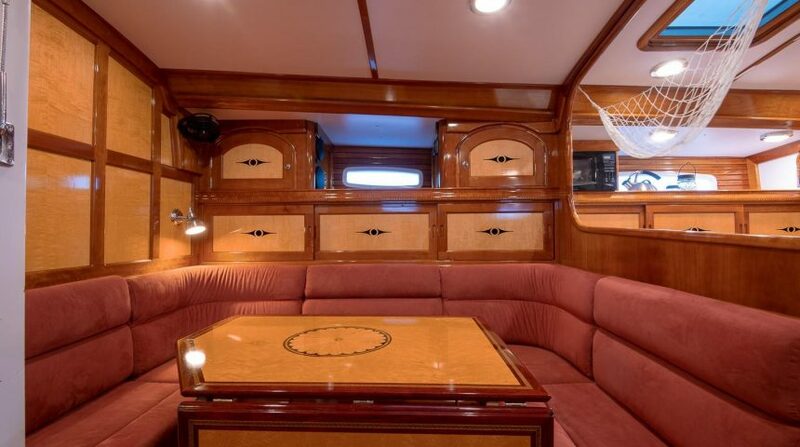 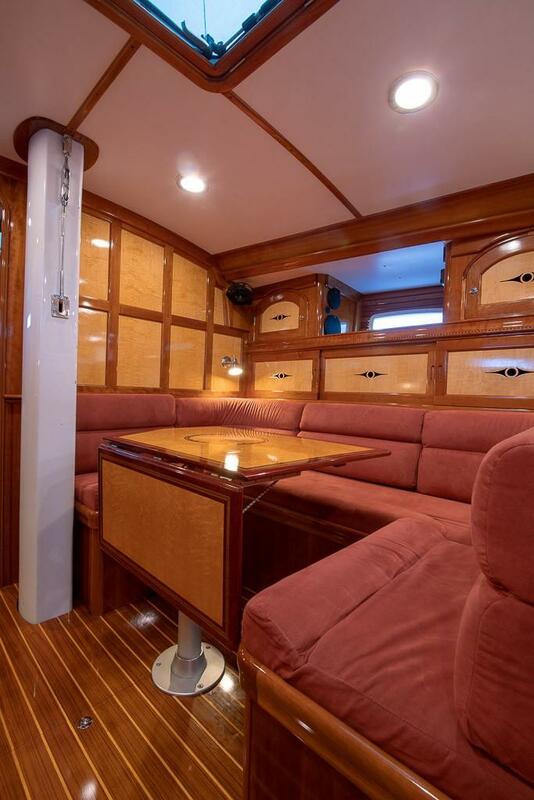 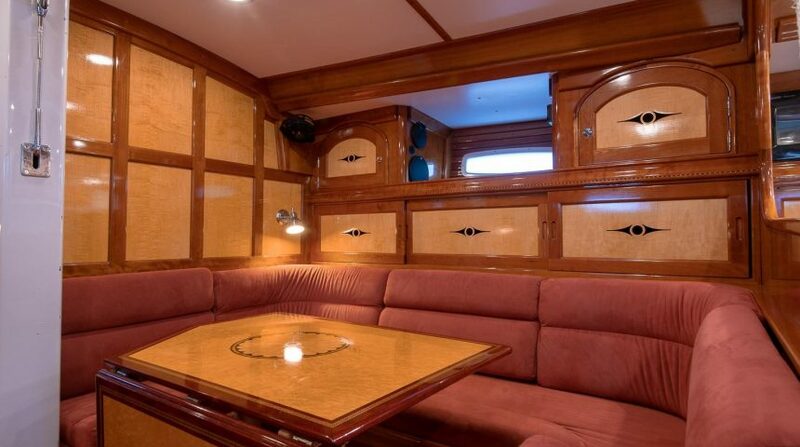 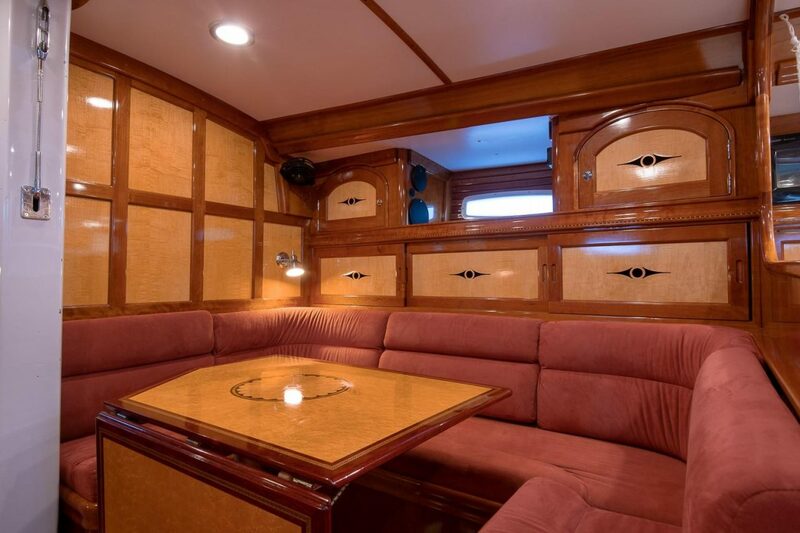 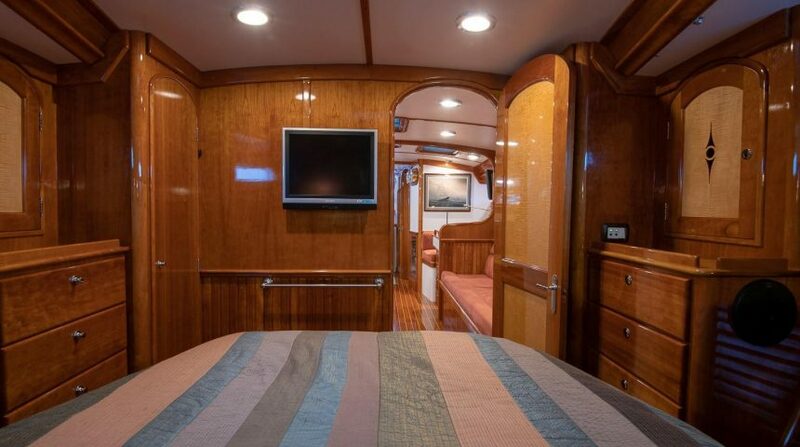 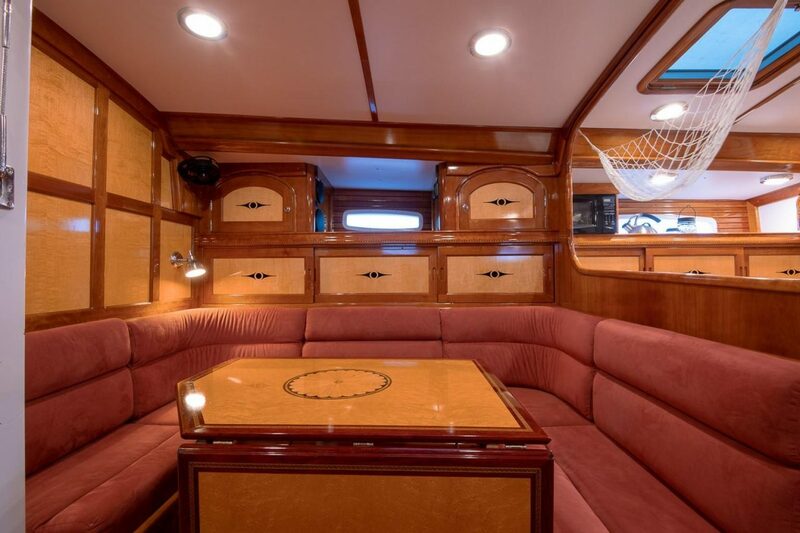 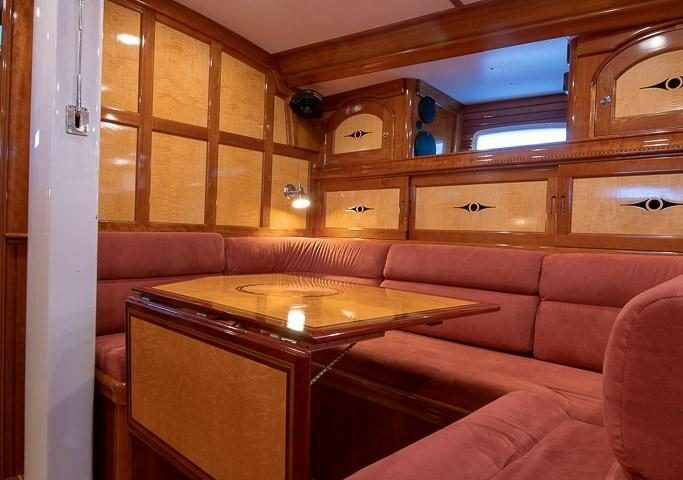 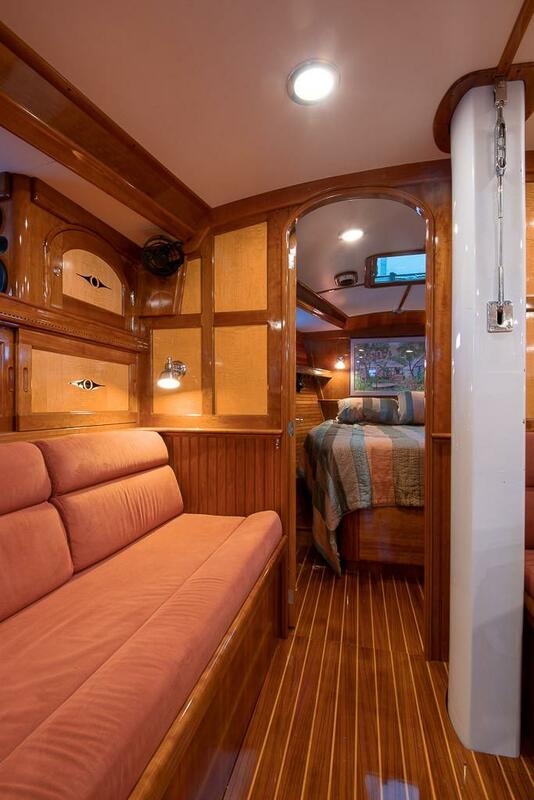 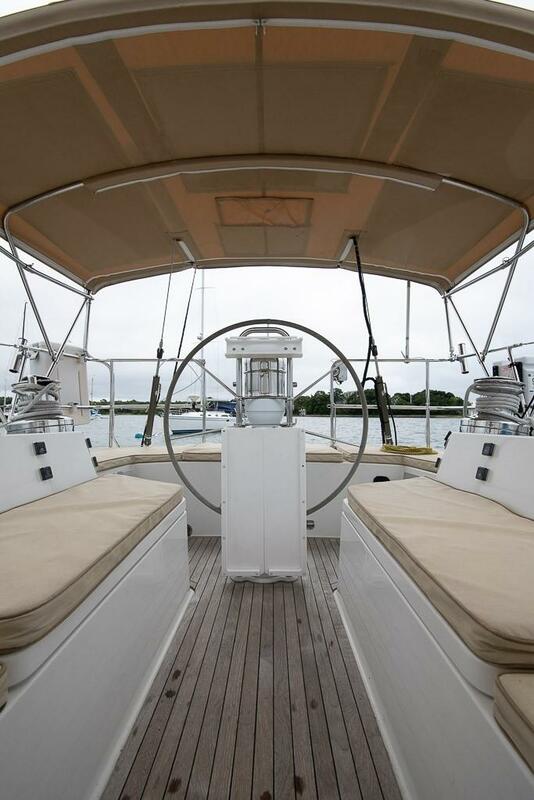 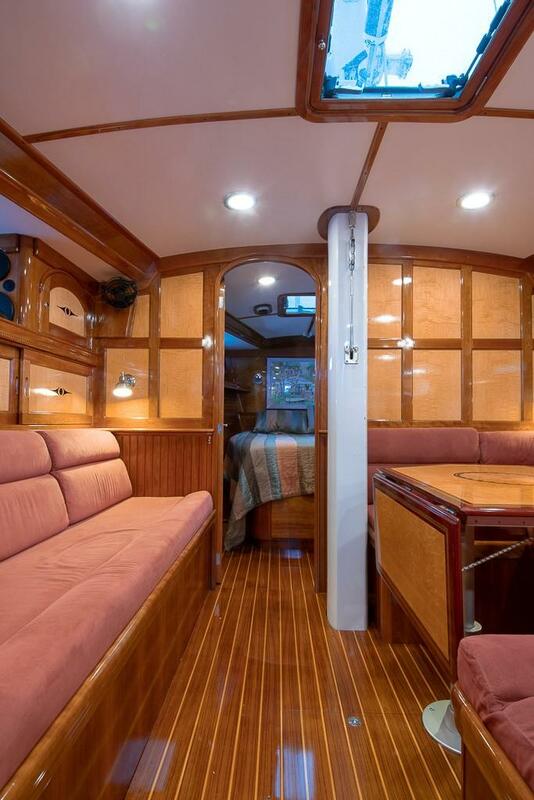 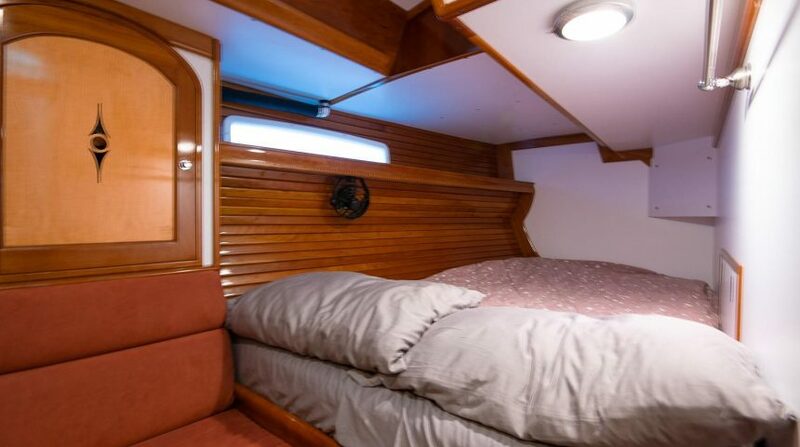 Ample light and ventilation is provided by the overhead hatches, hull ports and dorades. 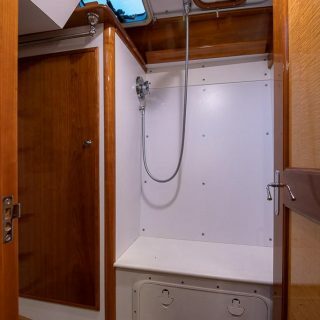 Upon entering the boat at the companionway a large separate shower stall is immediately to port. 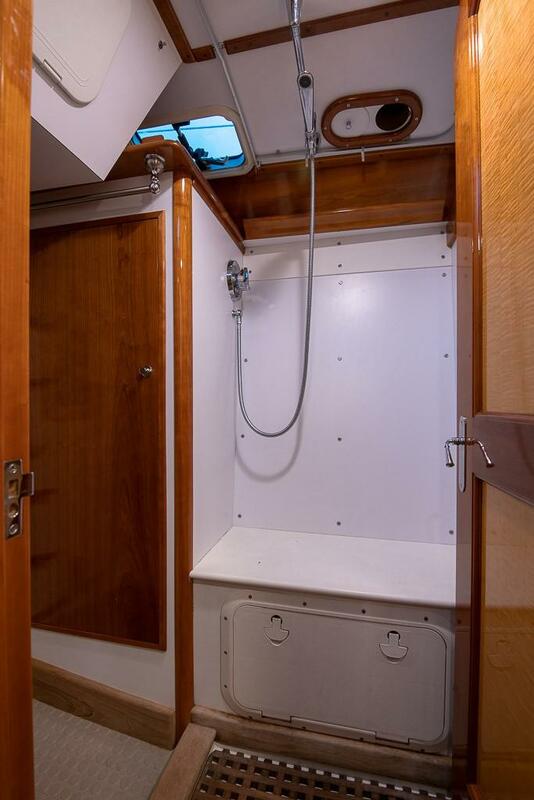 A watertight bulkhead door give access through the shower stall to the engine and mechanical space aft. 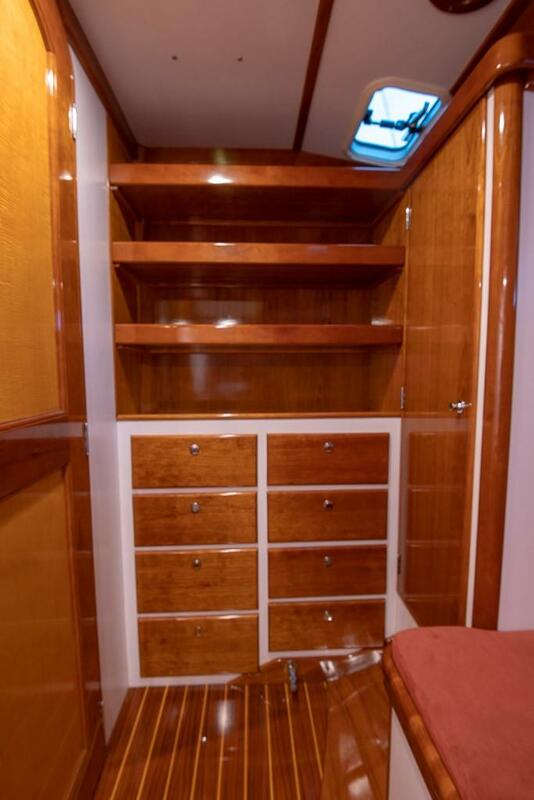 Built in drawers and lockers outboard give considerable storage. 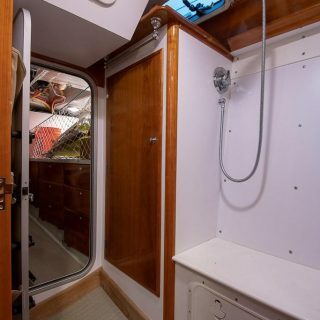 Access to this area (and additional light when working below) is also available through the port seat locker door in the cockpit. 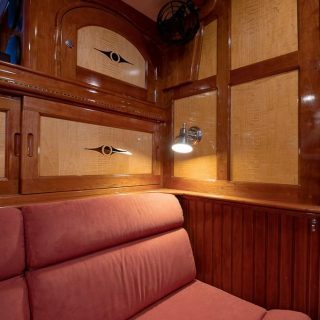 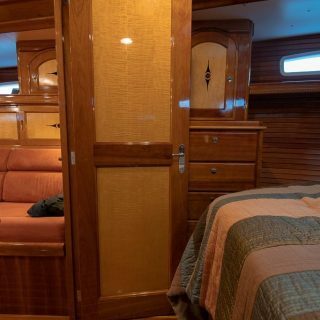 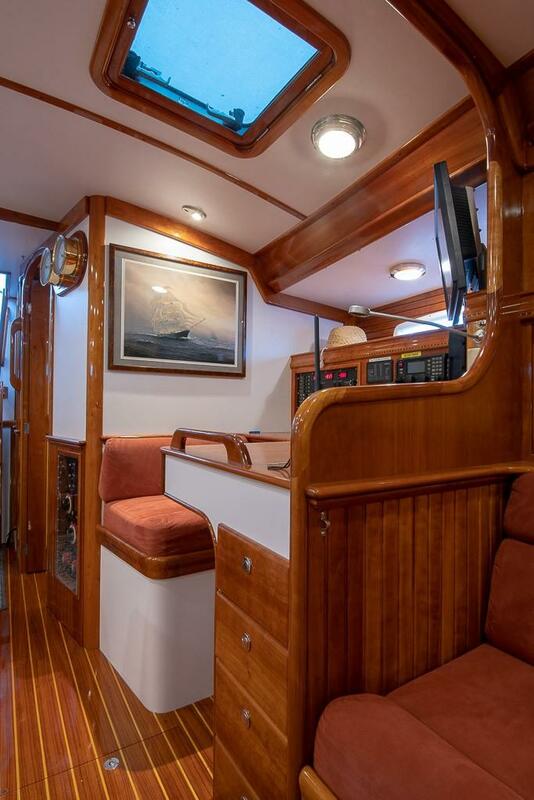 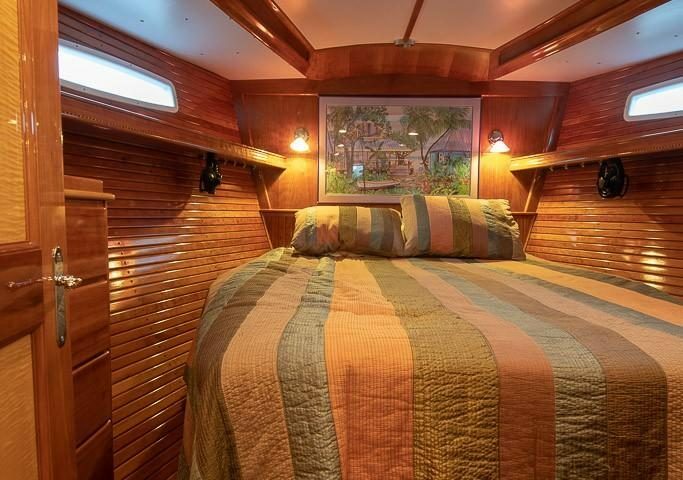 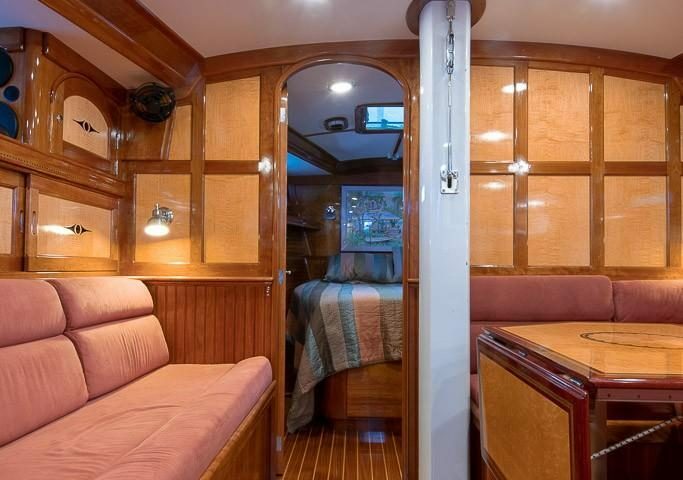 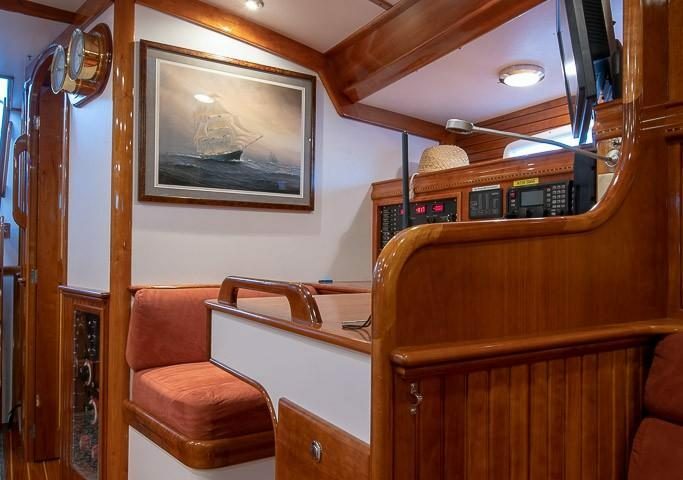 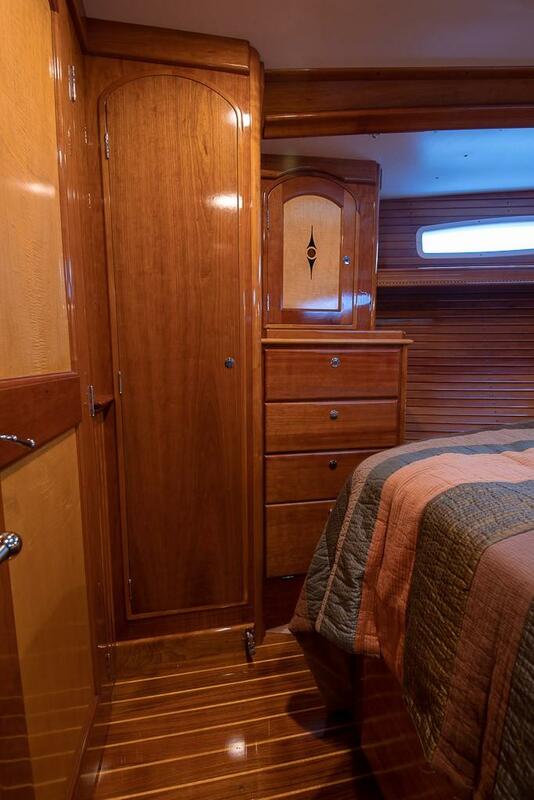 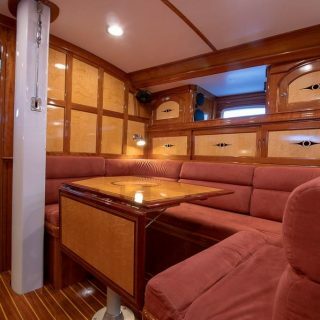 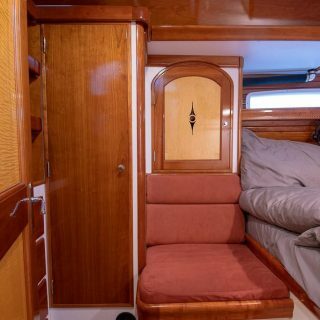 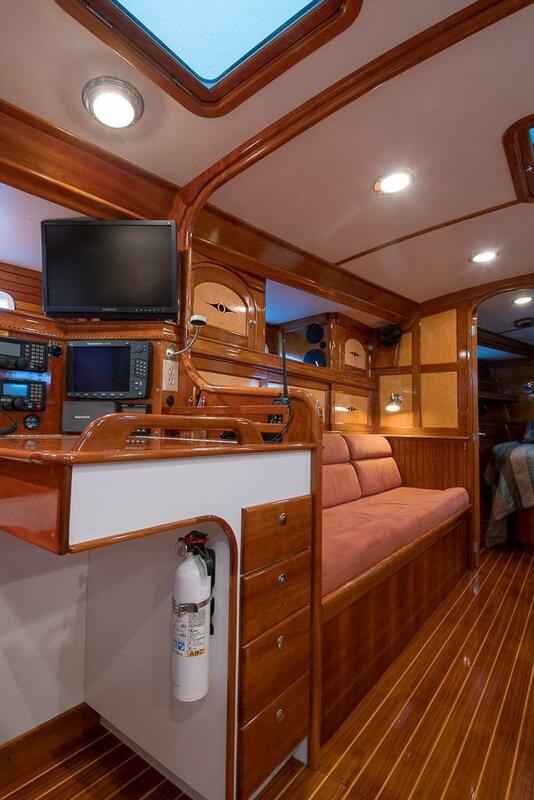 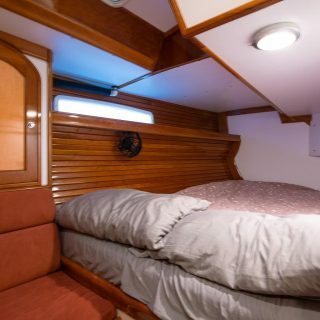 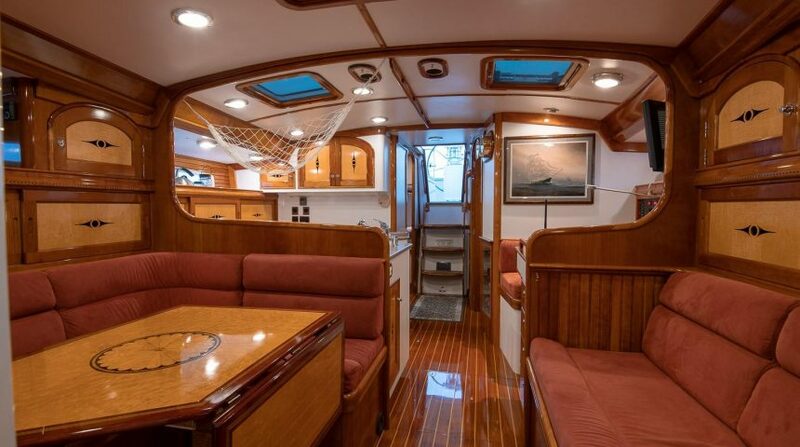 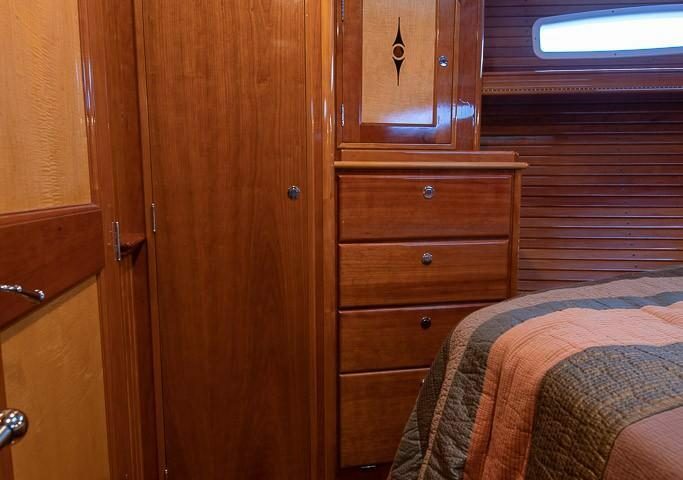 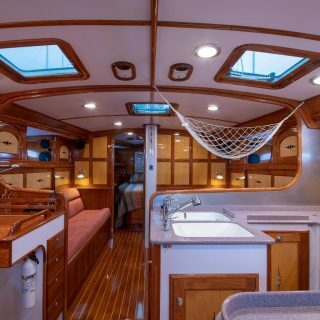 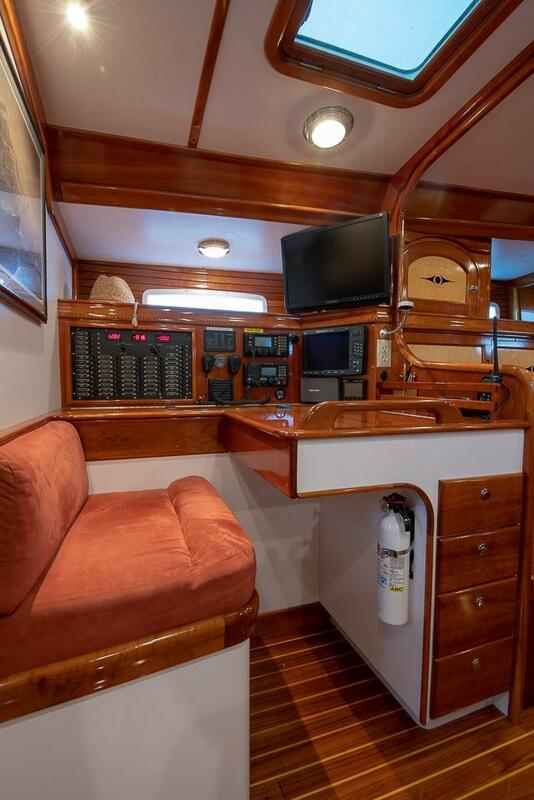 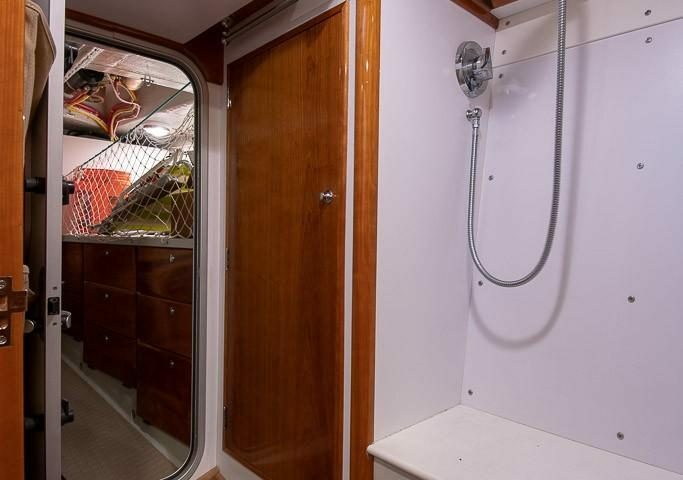 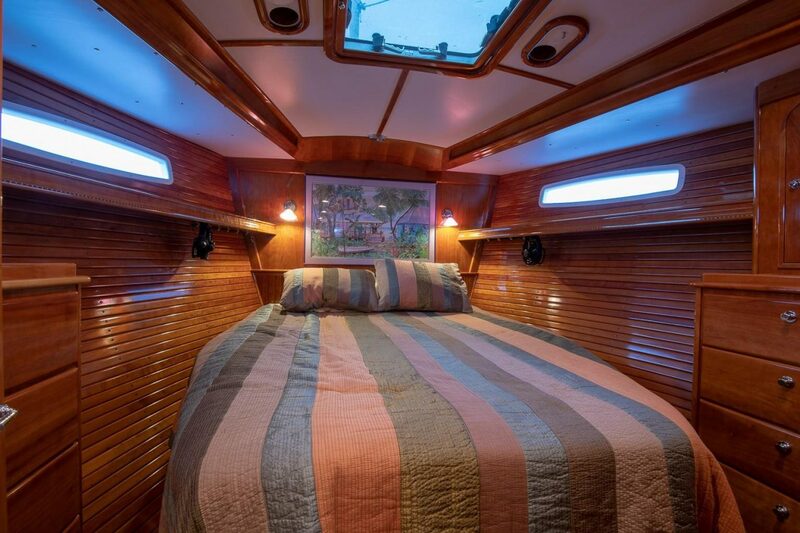 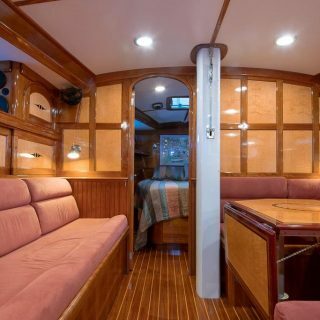 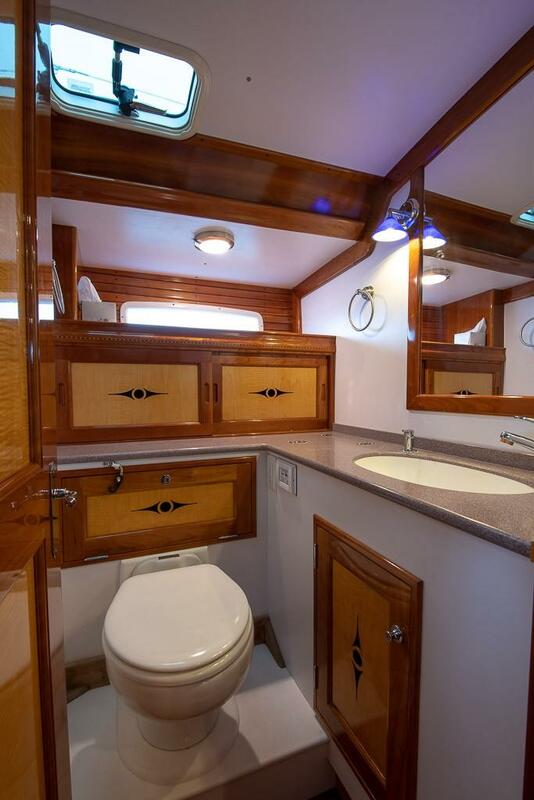 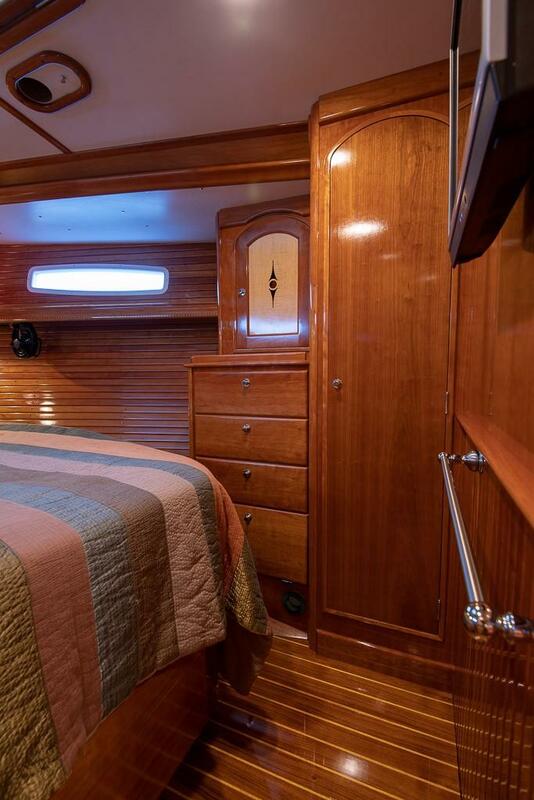 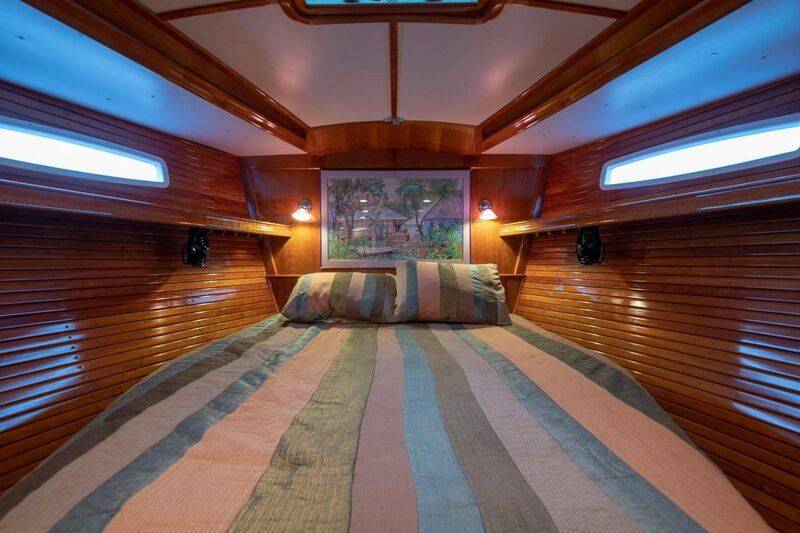 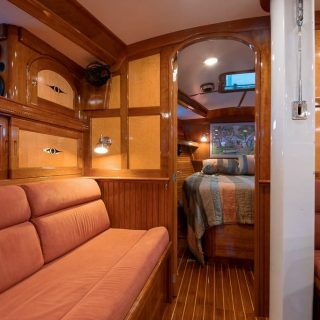 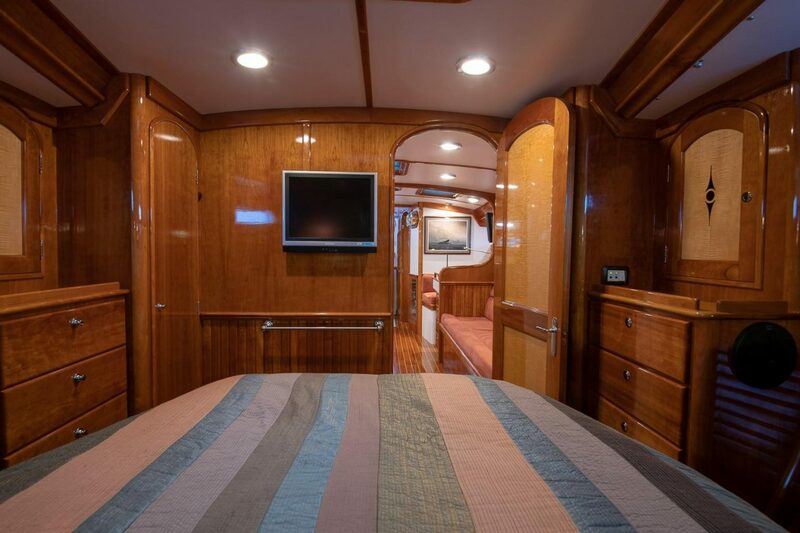 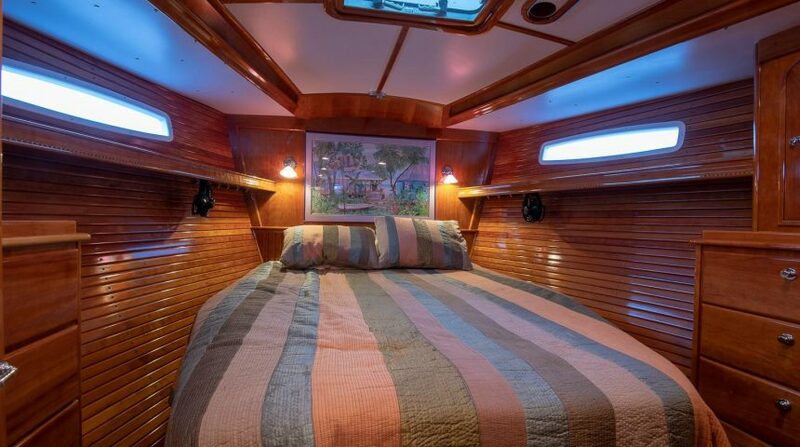 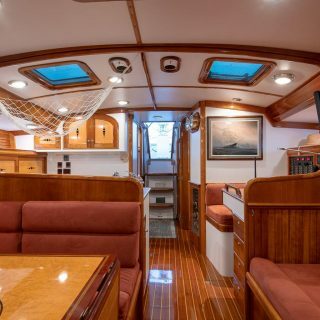 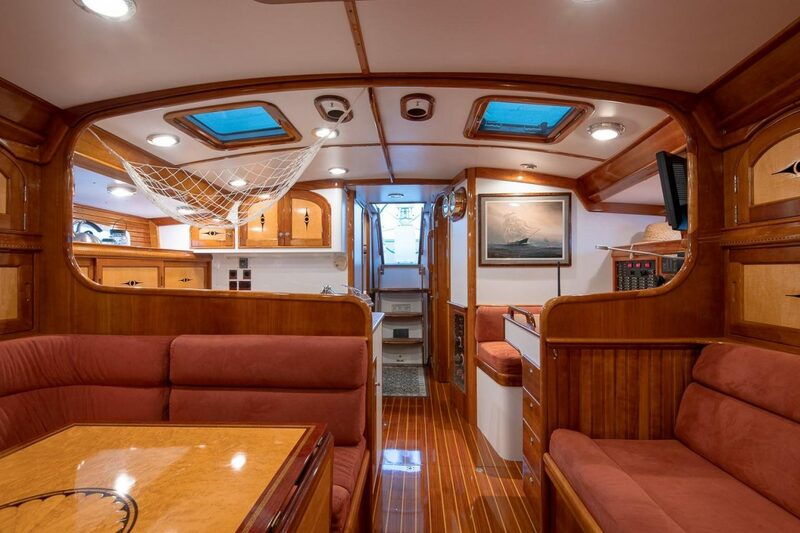 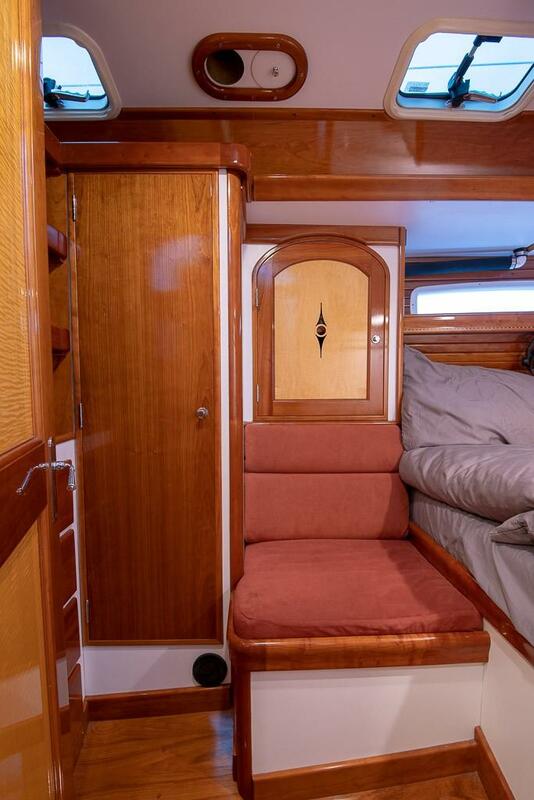 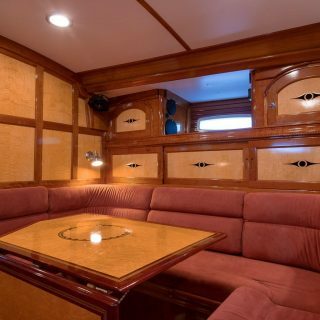 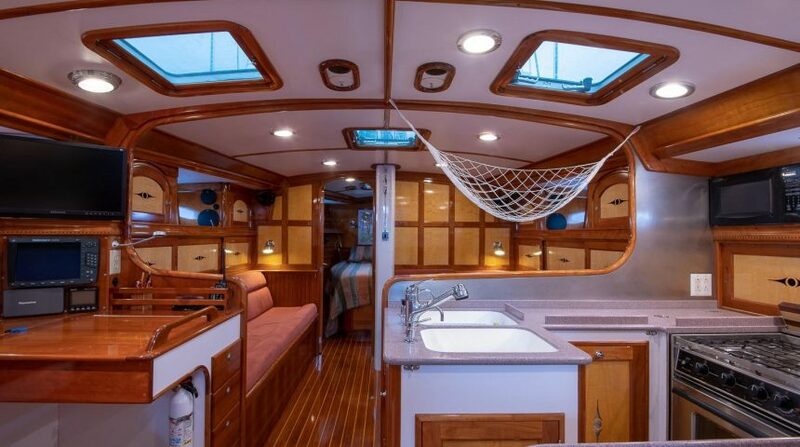 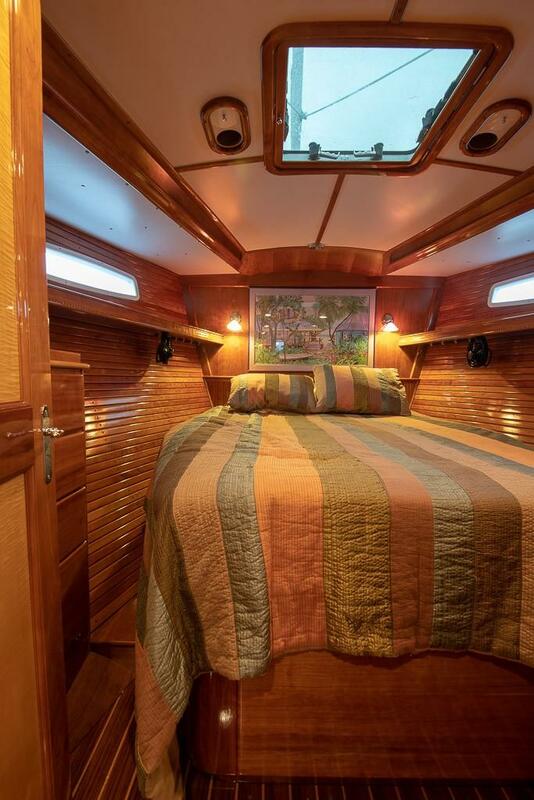 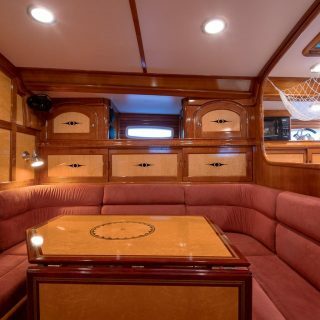 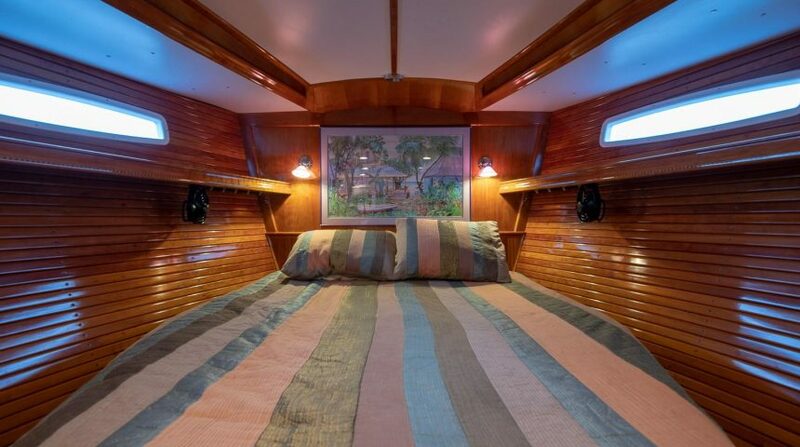 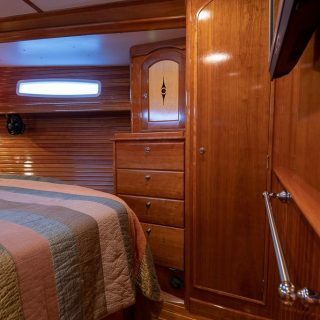 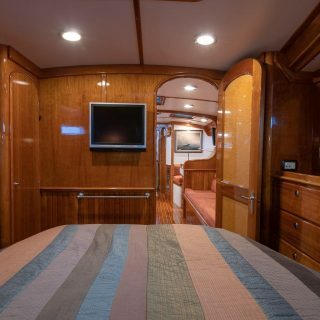 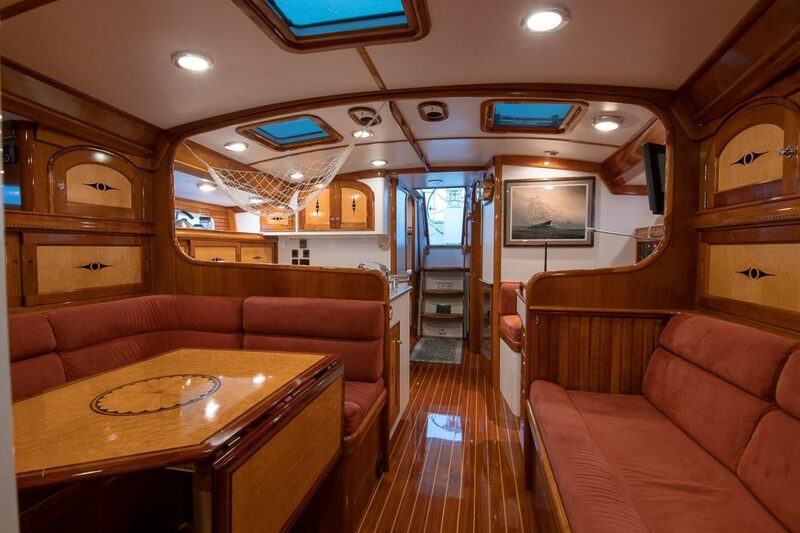 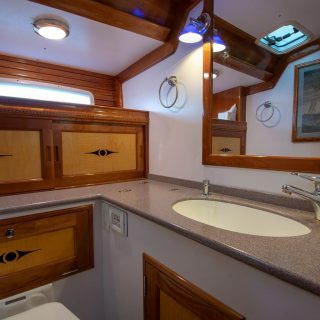 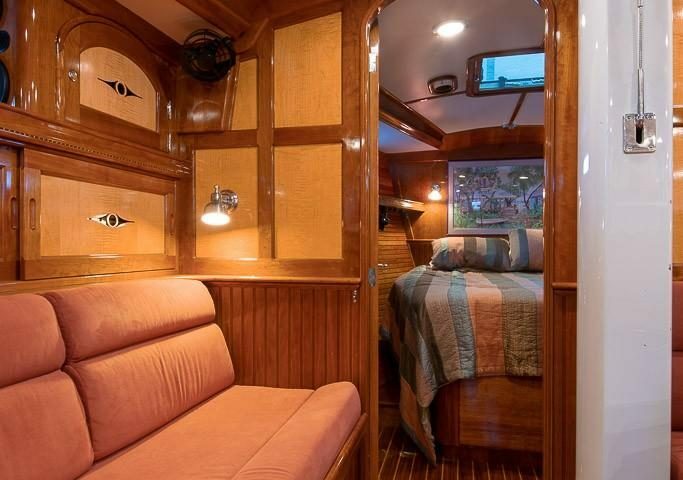 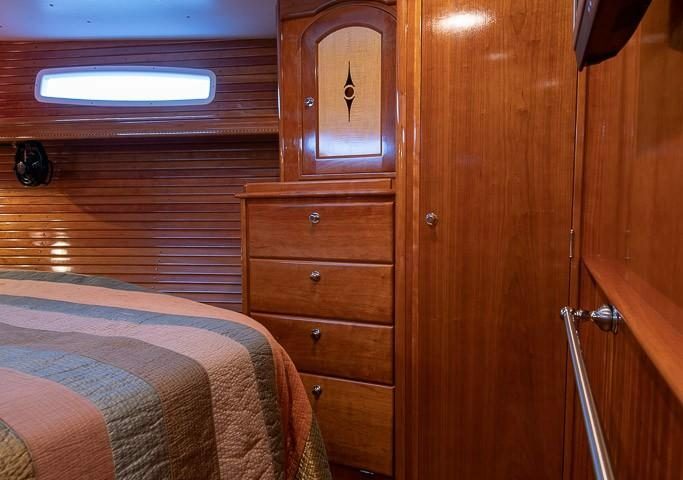 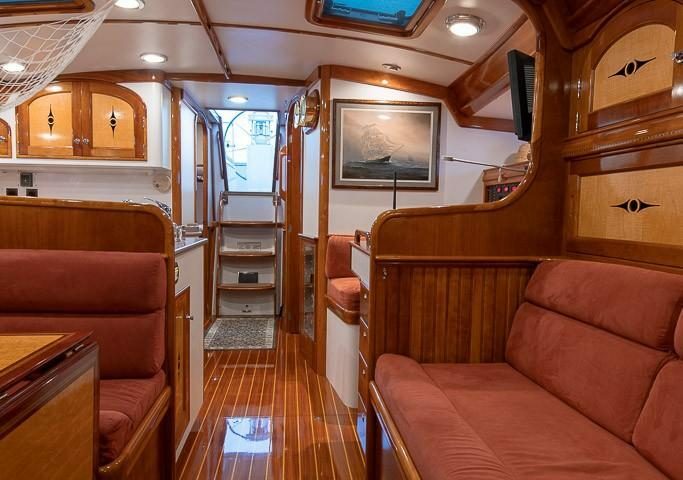 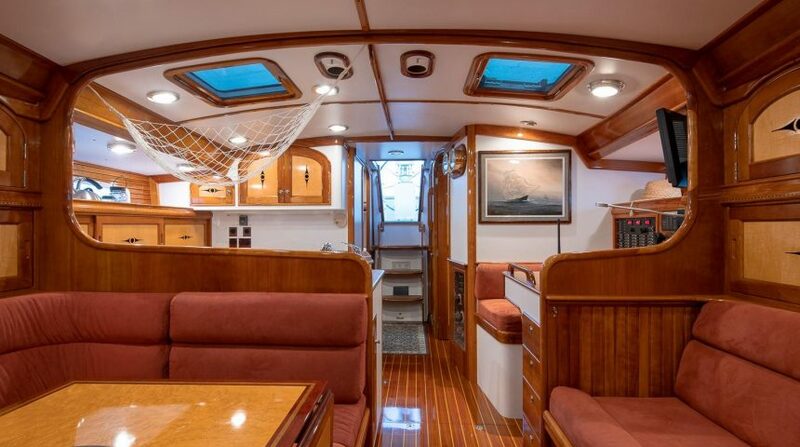 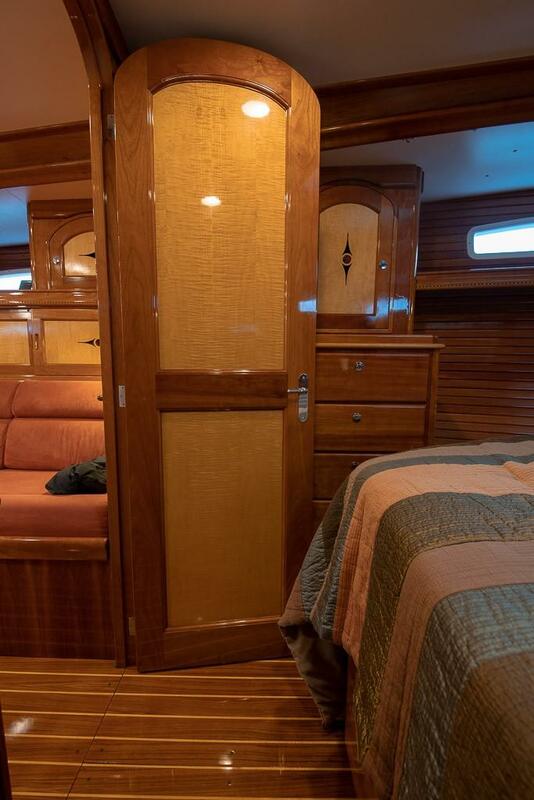 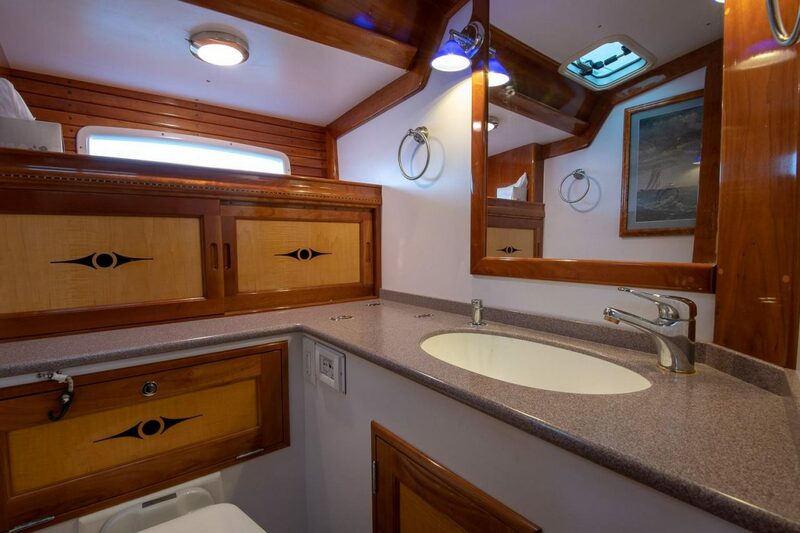 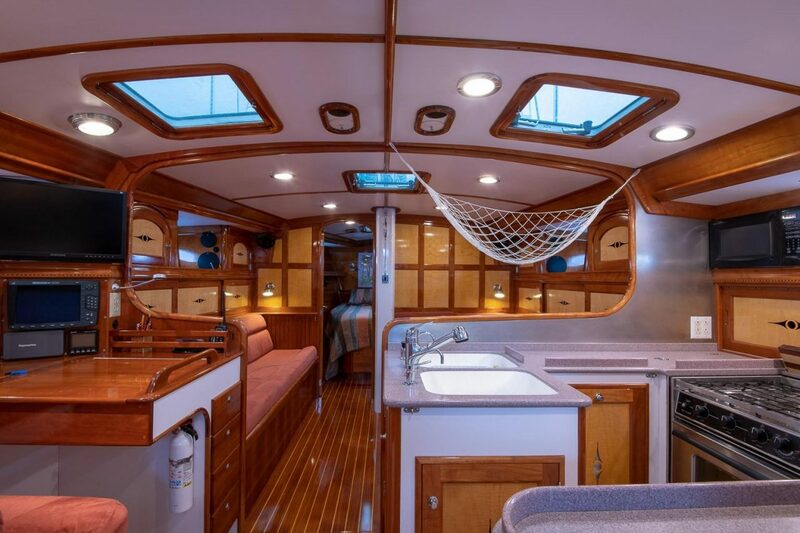 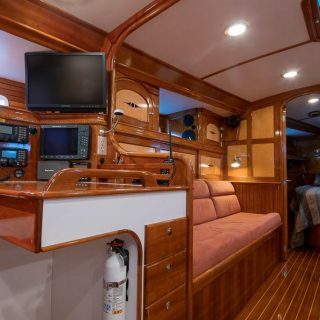 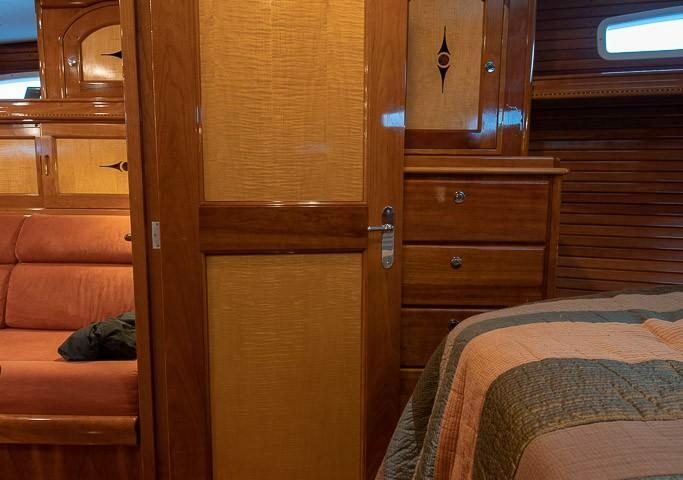 To starboard at the foot of the companionway is a quarter cabin with a hanging locker outboard and a large built in 8 drawer dresser and built in shelves above. 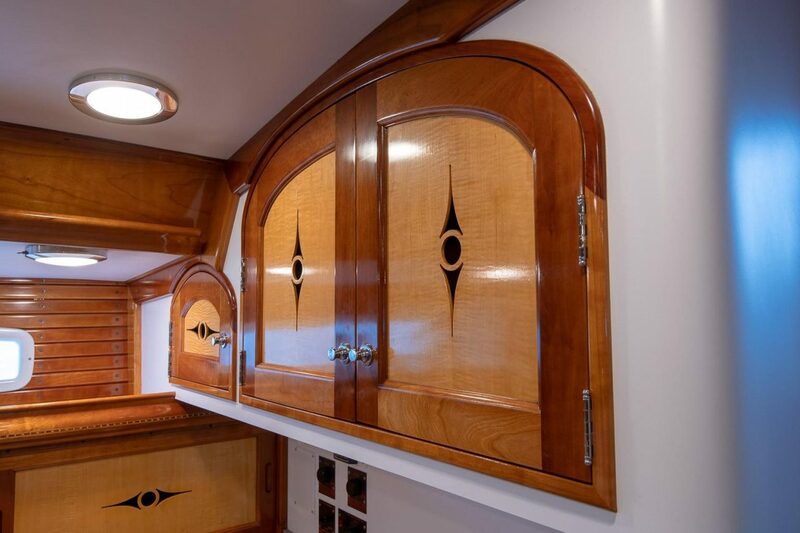 The hull is finished in cherry sheathing. 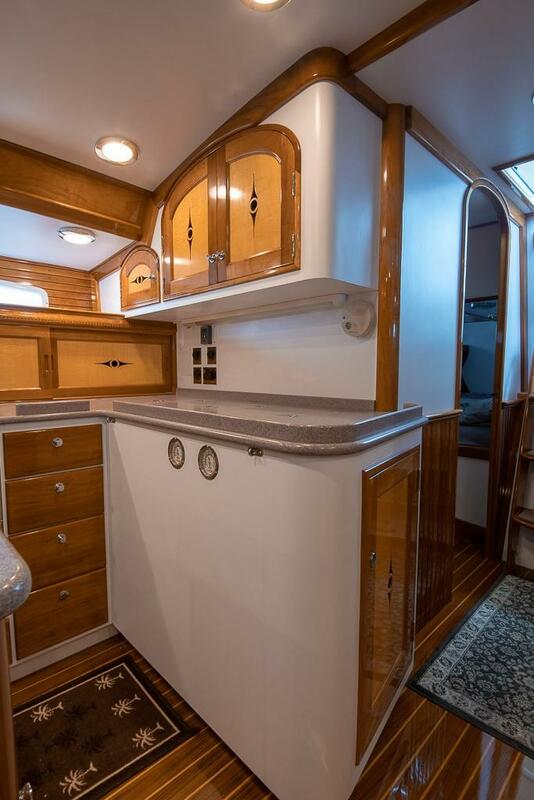 There is a full length shelf outboard and a hull portlight and overhead hatch for light and ventilation. 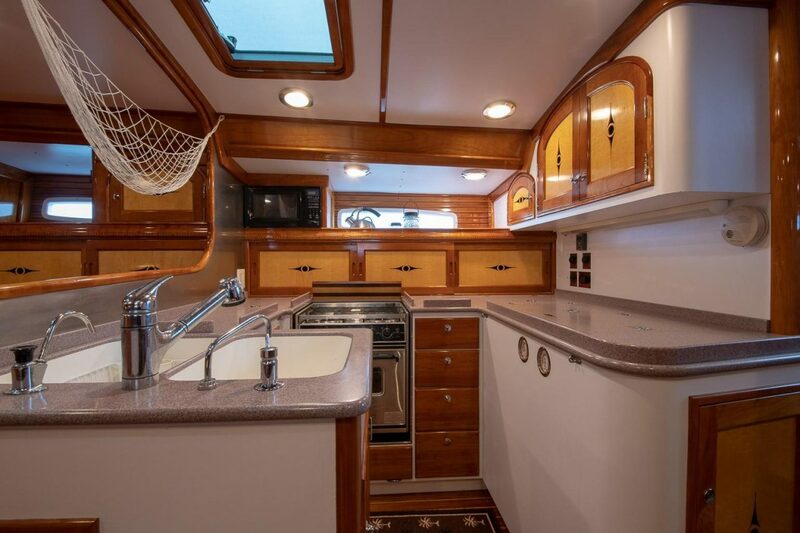 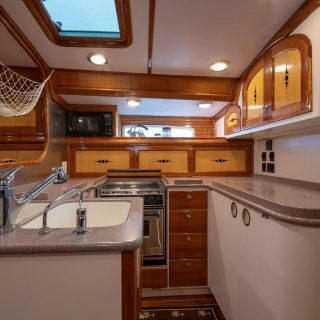 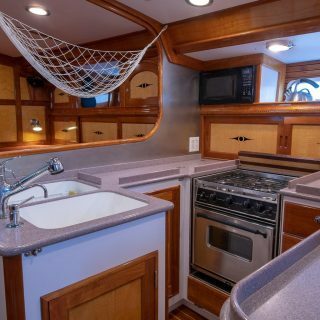 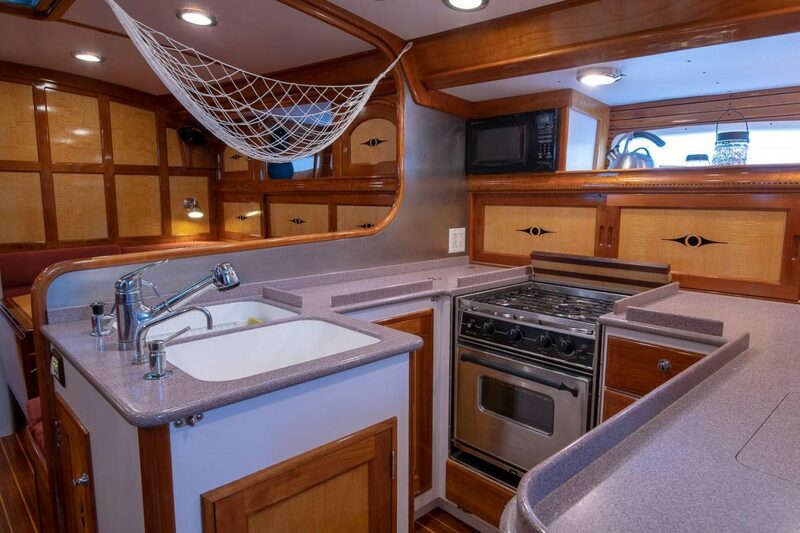 Moving forward on the starboard side is a spacious sea-friendly U-shaped galley with a three burner stove/oven outboard and a two basin sink facing inboard. 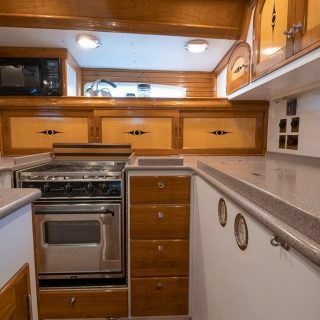 The galley is finished with Corian counter tops with fiddles. 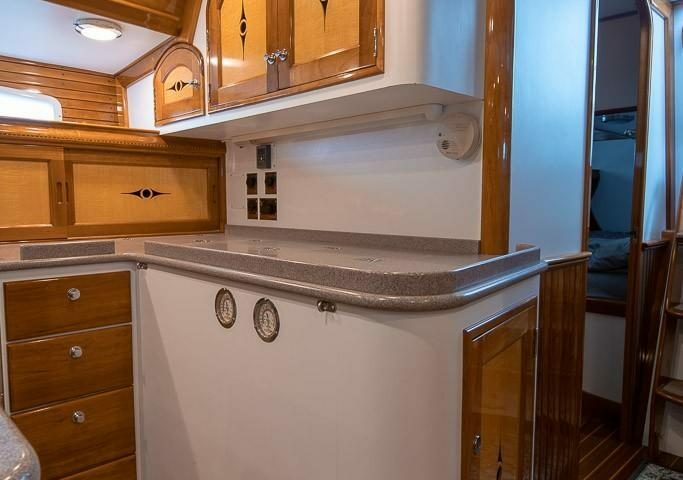 Separate Fridge and Freezer lift tops are along the aft bulkhead with arched storage lockers above. 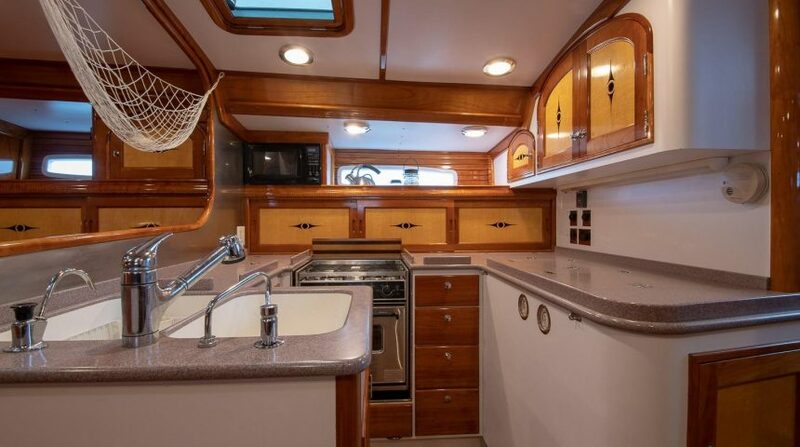 Outboard are three storage compartments with sliders and a built-in microwave above. 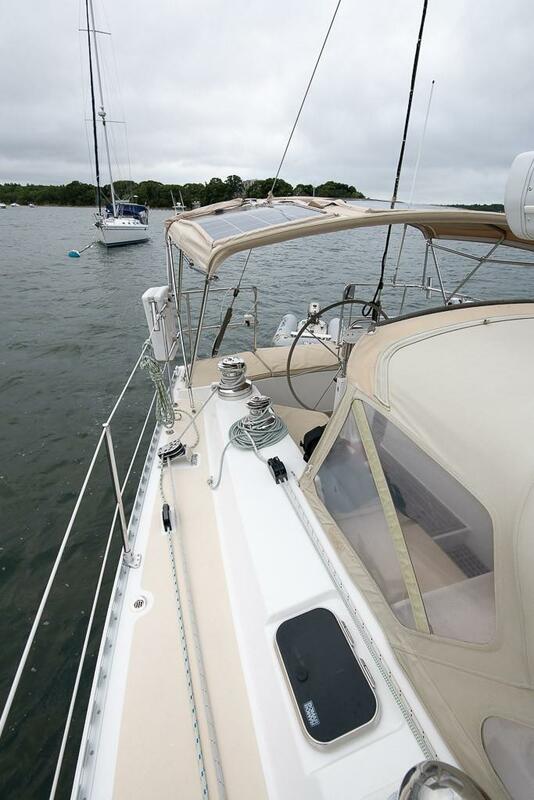 Dry storage is available through lift tops outboard fore and aft. 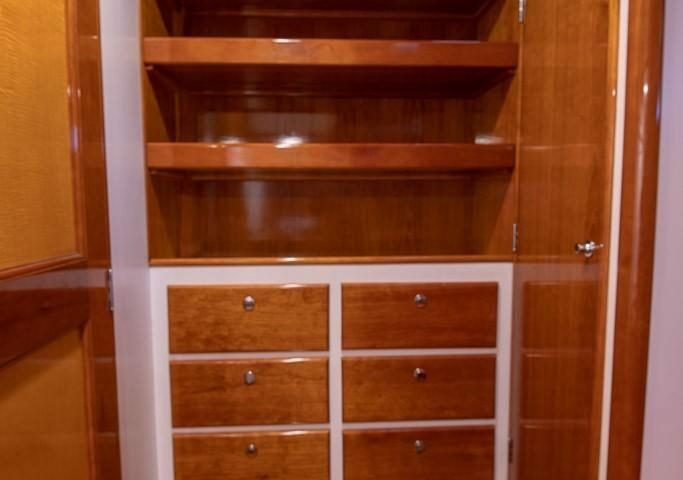 Additional storage is offered in drawers and lockers below. 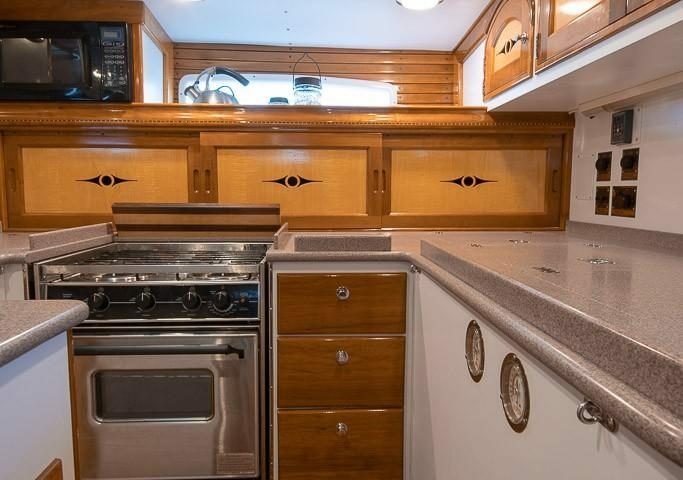 Opposite the galley is a head with a Corian countertop and sink. 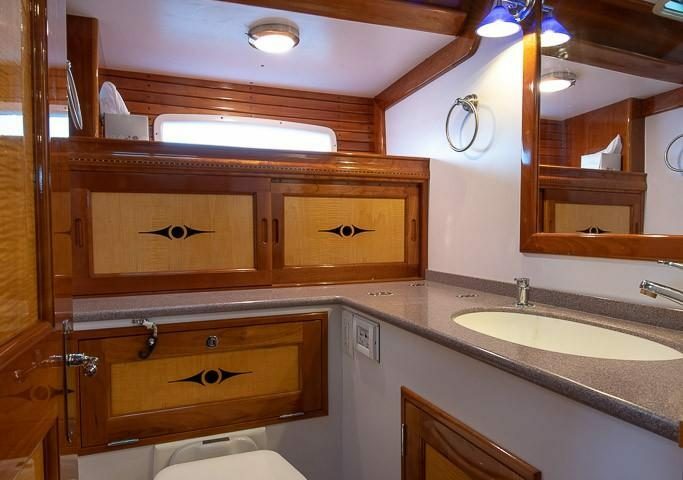 A cherry framed mirror is on the forward bulkhead. 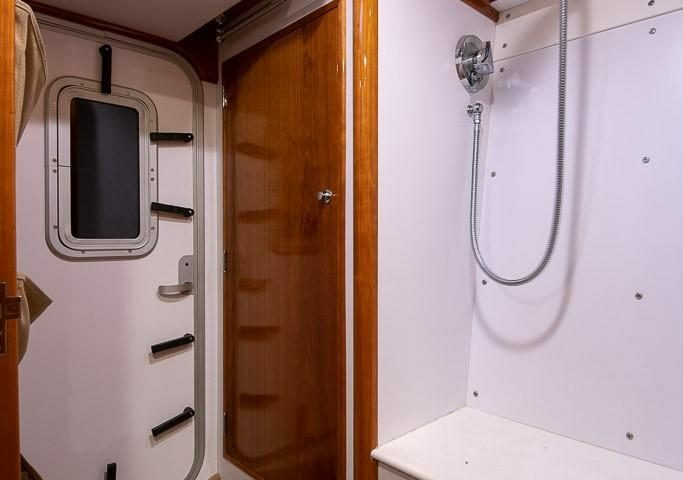 Storage is available from an outboard shelf and two sliders, a hinged locker in the counter as well as another locker outboard and under the sink. 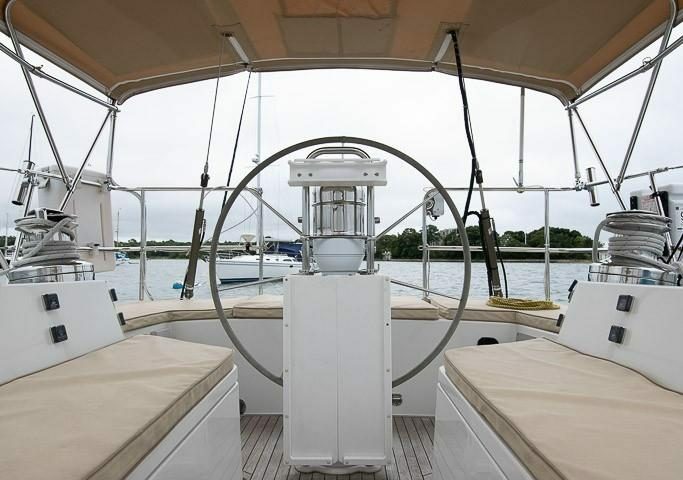 Just forward of the head is a forward facing nav station. 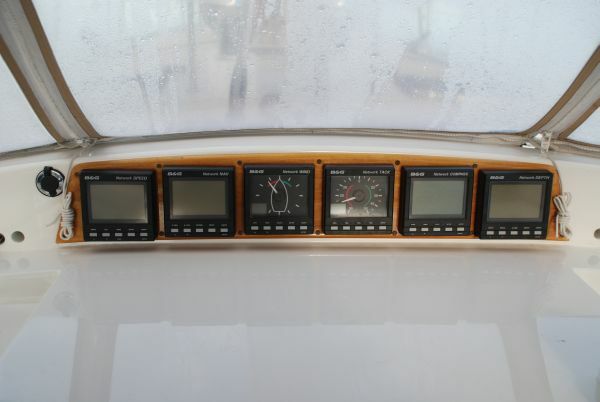 Outboard is a full breaker panel with digital amp and volt meters. 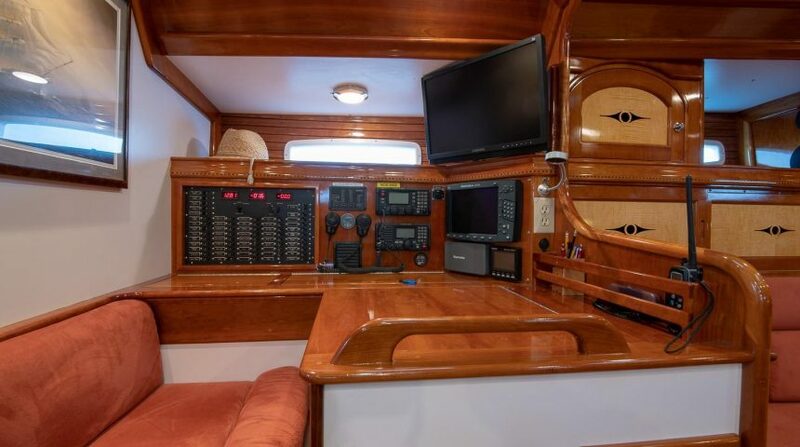 All instrumentation is flush mounted outboard and forward. 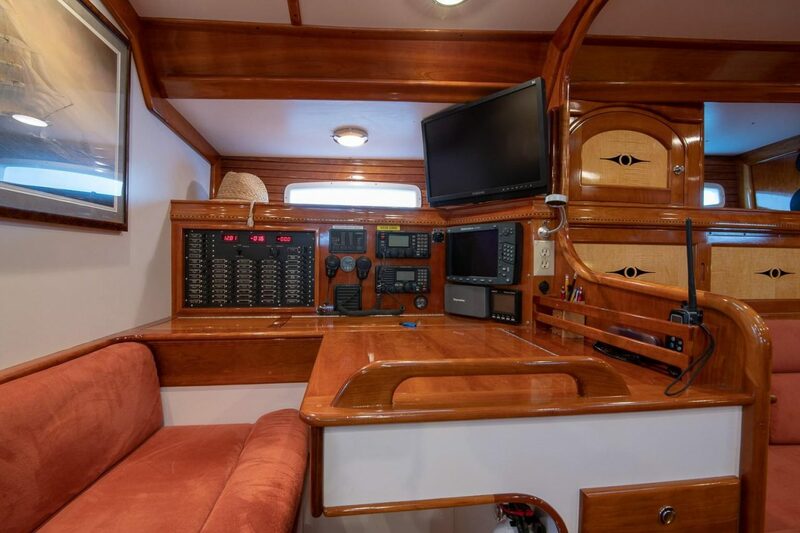 A full size computer monitor is mounted diagonally inboard at eye level. 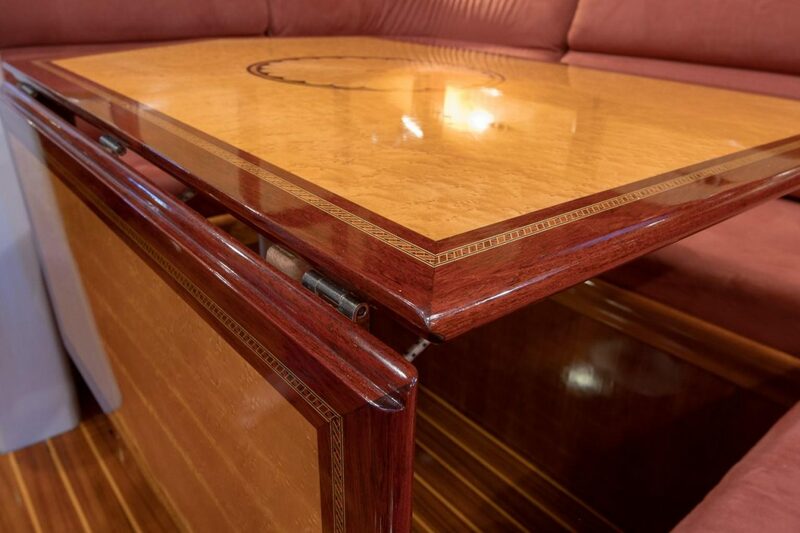 The chart table top is hinged with storage within. 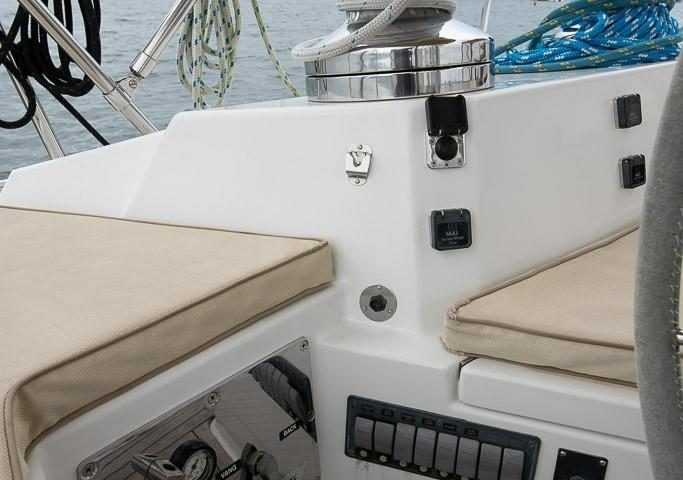 Outboard are two more lift-up storage areas. 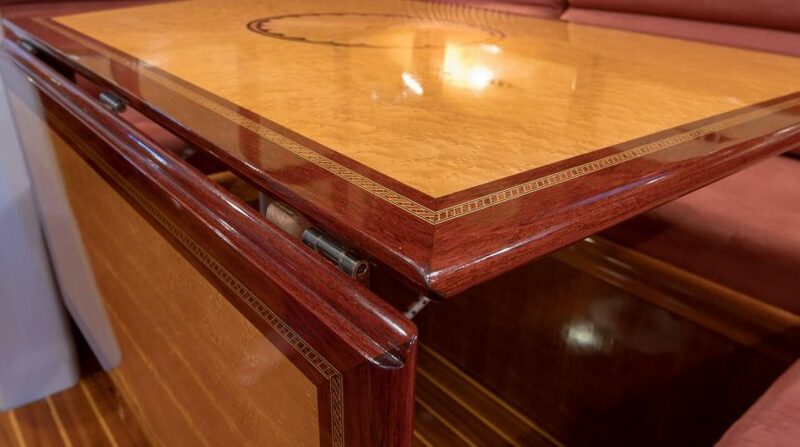 Drawers are built in below the desk for additional storage. 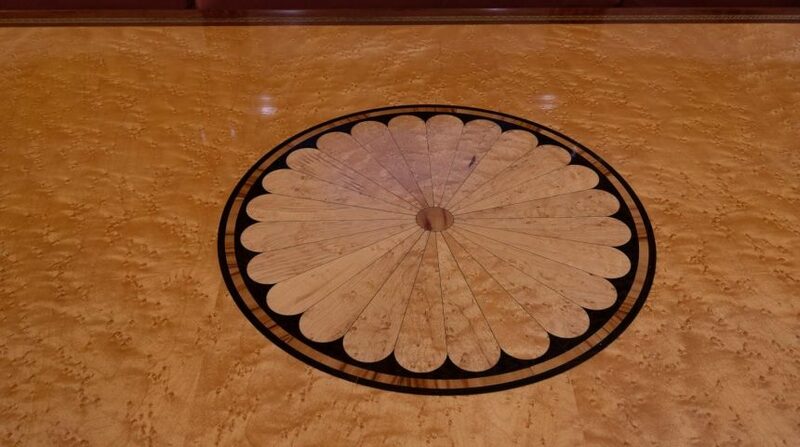 The main salon is beautifully finished with a raised panel forward bulkhead in cherry and curly maple. 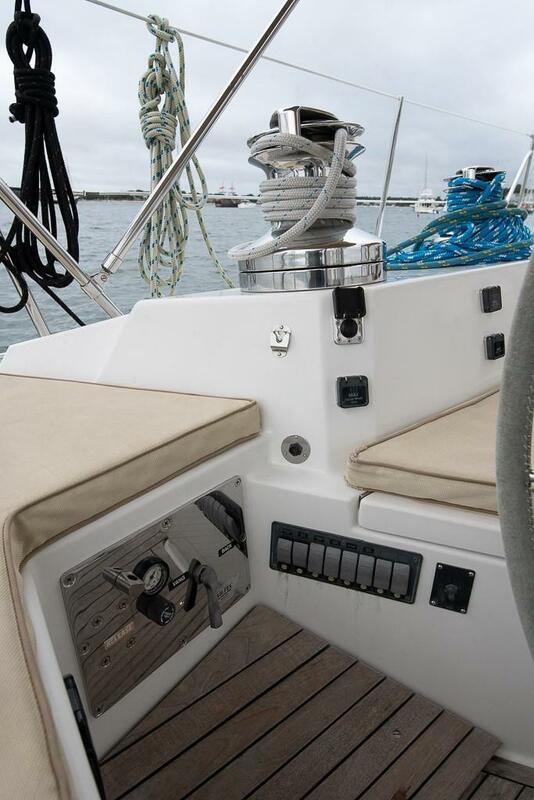 Outboard on the port and starboard are lockers (sliding lowers and hinged uppers with arched tops). 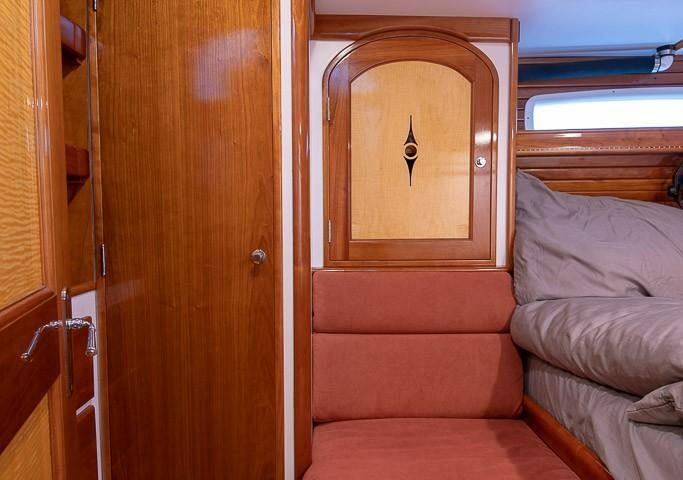 A full length settee is located to starboard and a U-shaped settee with a large table to starboard. 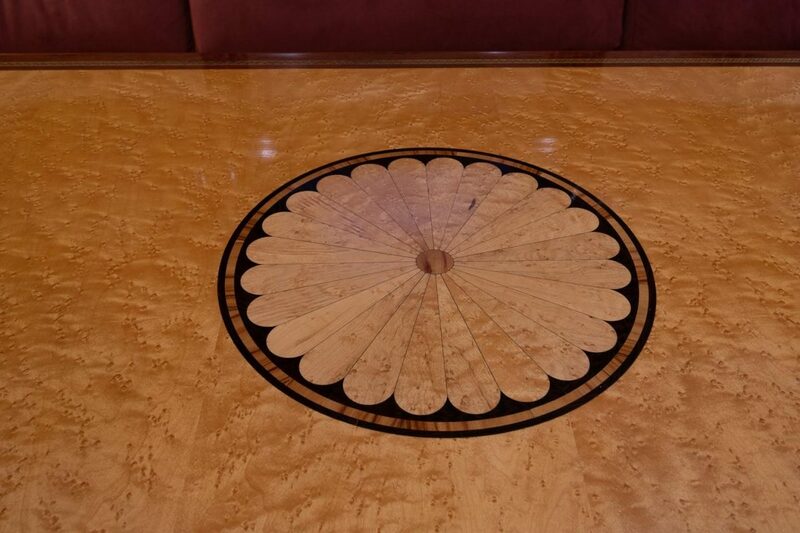 The dinette table has a hinged leaf and a detailed inlay on the top. 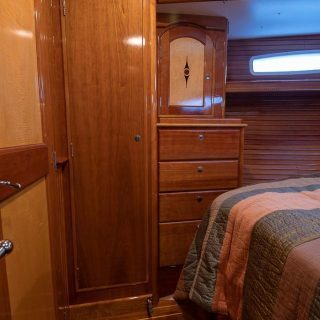 Forward of the main salon is a spacious stateroom with a centerline queen bunk. 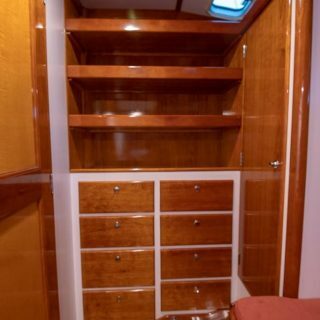 Ample storage is outboard both port and starboard in the way of hanging lockers, upper lockers, and dressers below with drawers. 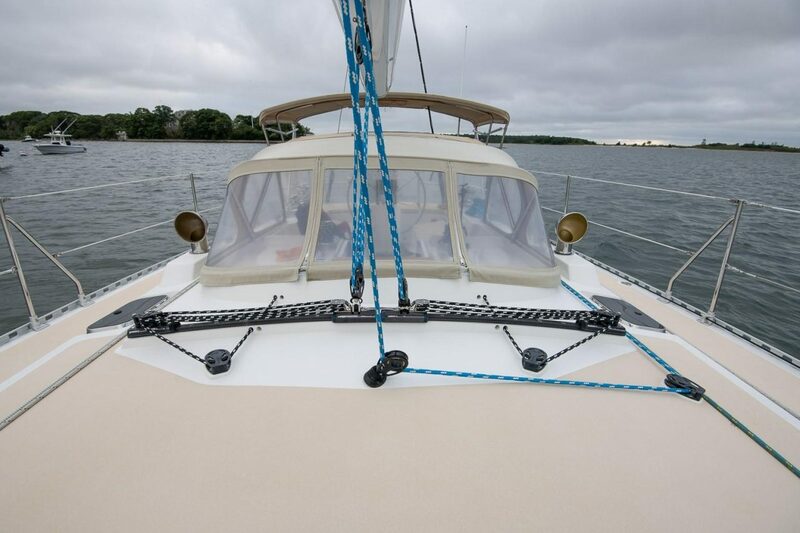 The hull is finished with cherry sheathing. 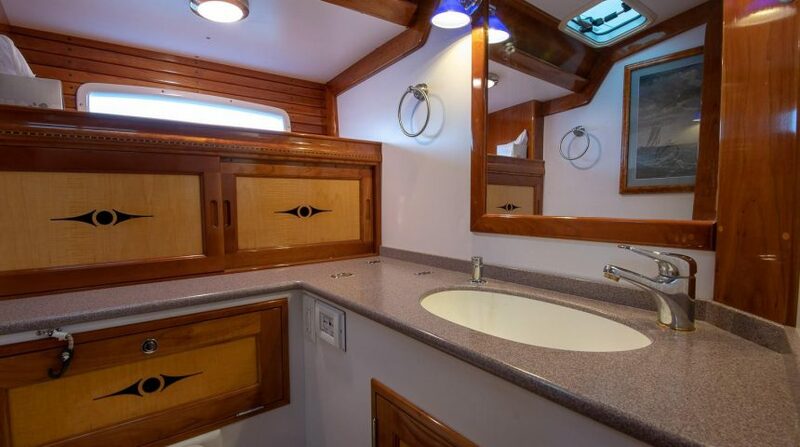 Two hull ports and an overhead hatch give plenty of light and ventilation. 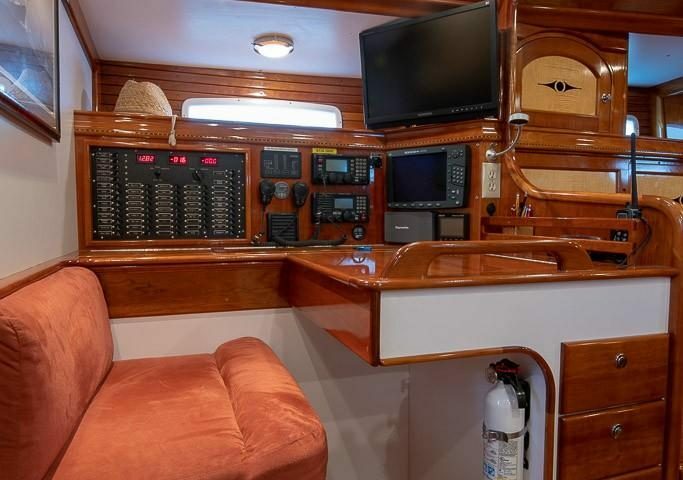 A flat screen TV is mounted on the aft bulkhead. 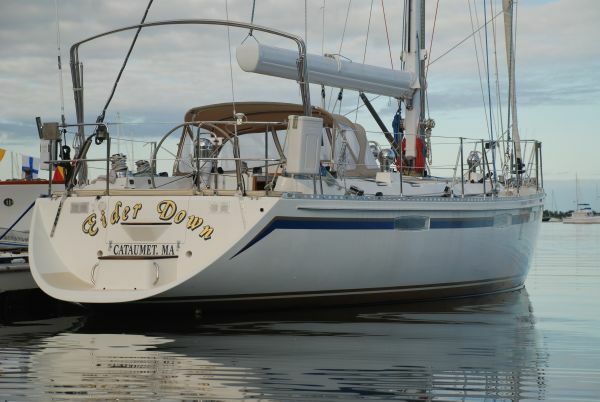 The electrical system on Eider Down has been carefully designed, installed and maintained and updated utilizing high quality tinned boat wire and components and is laid out so as to be easily accessible for service and upgrades. 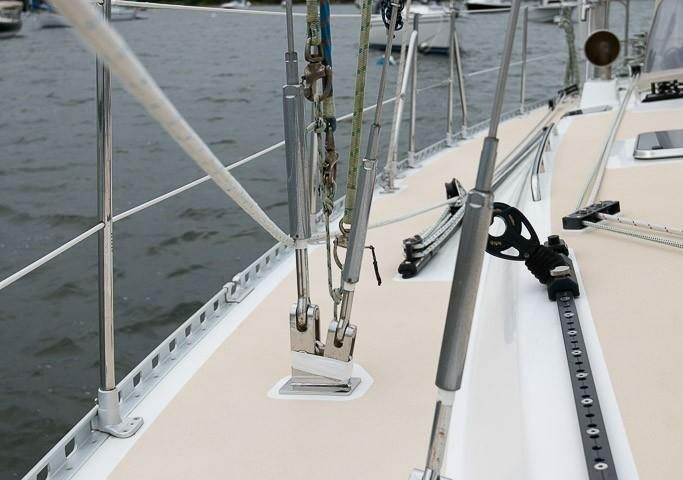 Wire runs are neatly run and well secured with each end numbered for identification. 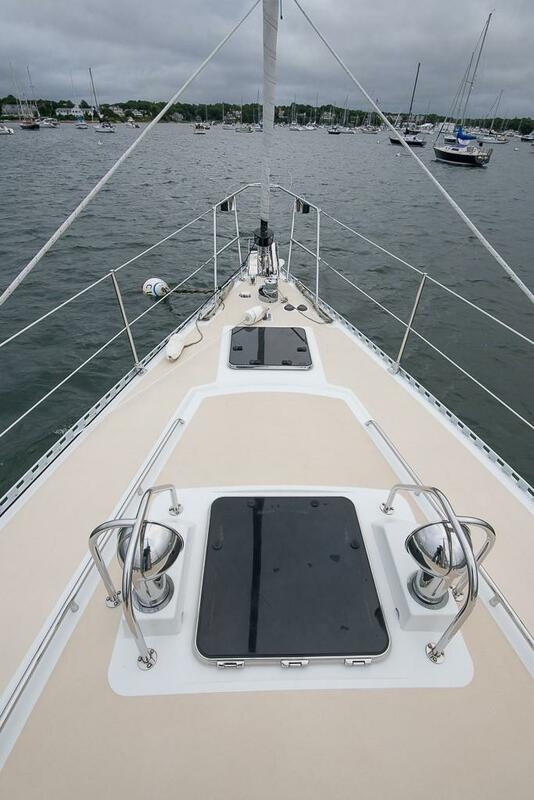 110VAC 30 Amp shore power. 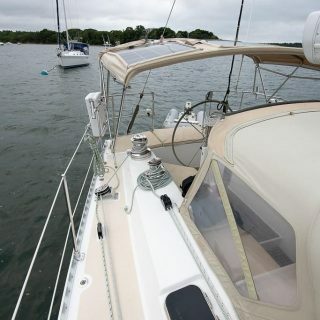 Heart 2500 watt Inverter with remote control panel at nav station. 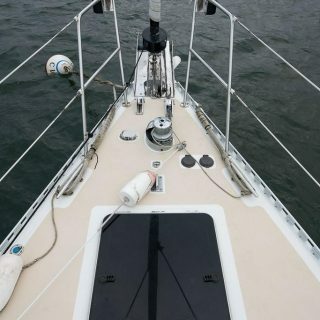 Heart 90 amp battery charger. 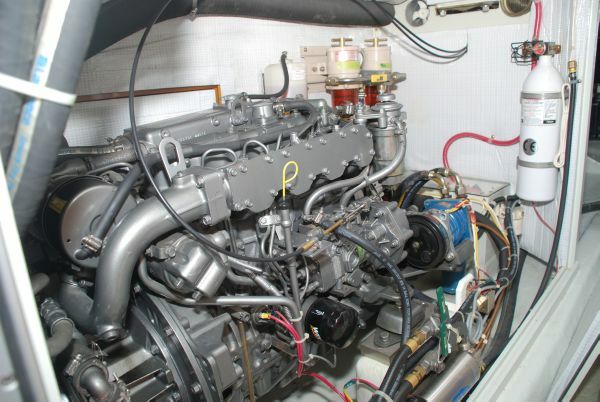 Secondary alternator for charging start battery. 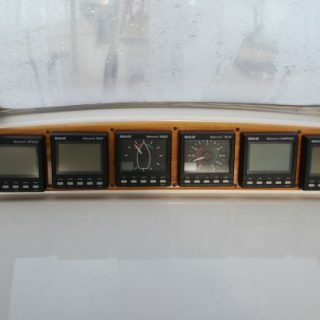 (2) Northstar 6000I chart plotters (cockpit bulkhead & nav station). 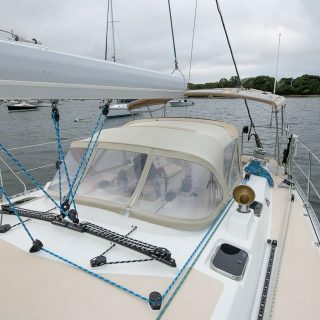 B&G Multi Data (at nav station). 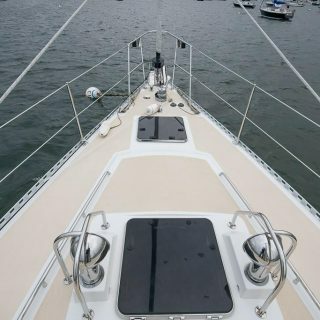 B&G Depth. 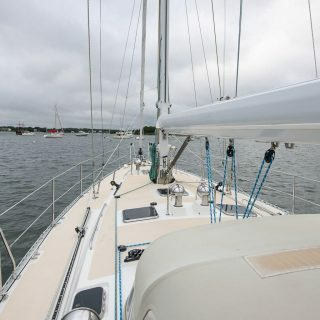 (at sea hood). 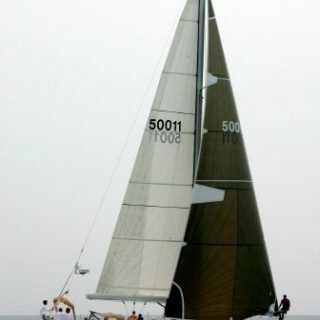 B&G Speed/Log (at sea hood). 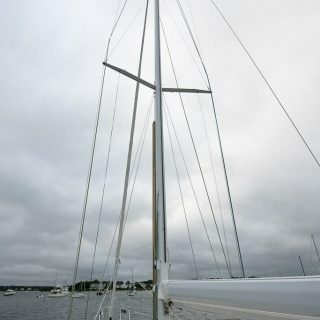 B&G Wind (at sea hood). 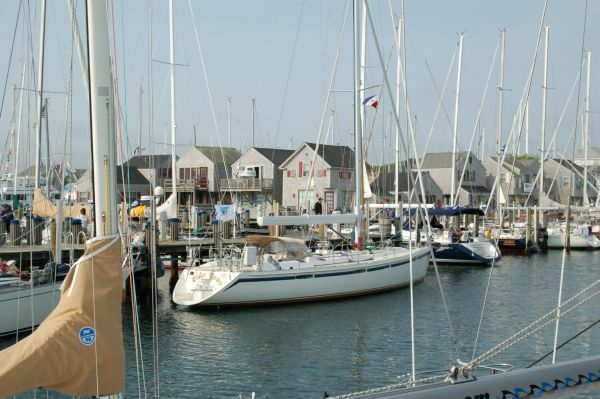 B&G Tack (at sea hood). 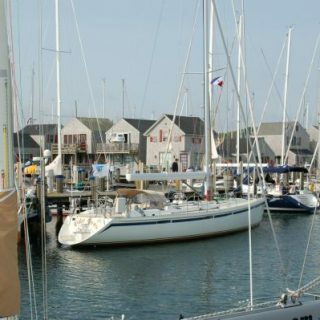 B&G Compass (at sea hood). 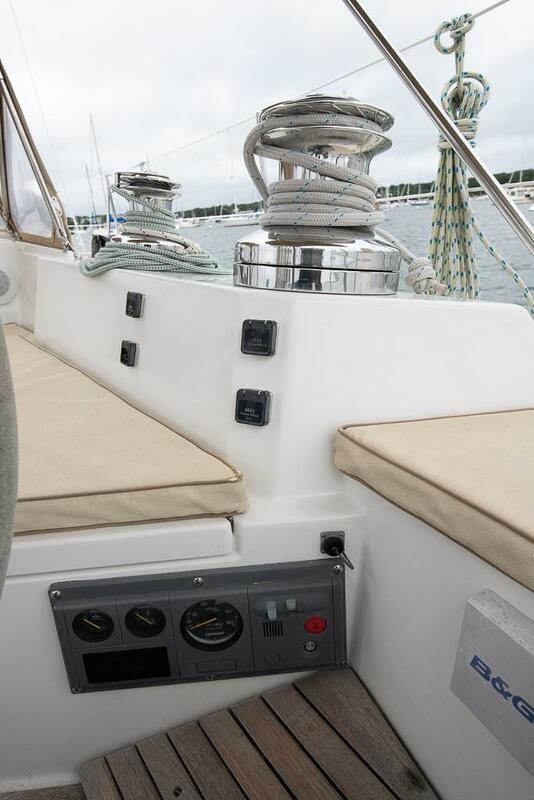 Raymarine RH200 GPS (nav station). 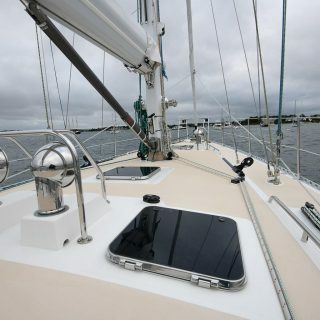 Icom IC-M602 VHF Radio (nav station). 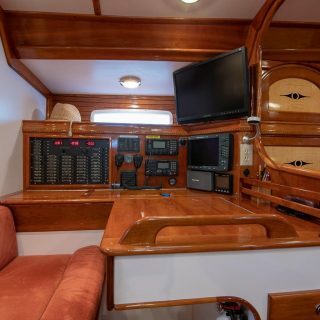 Icom IC802 SSB (nav station) with AT-140 tuner. 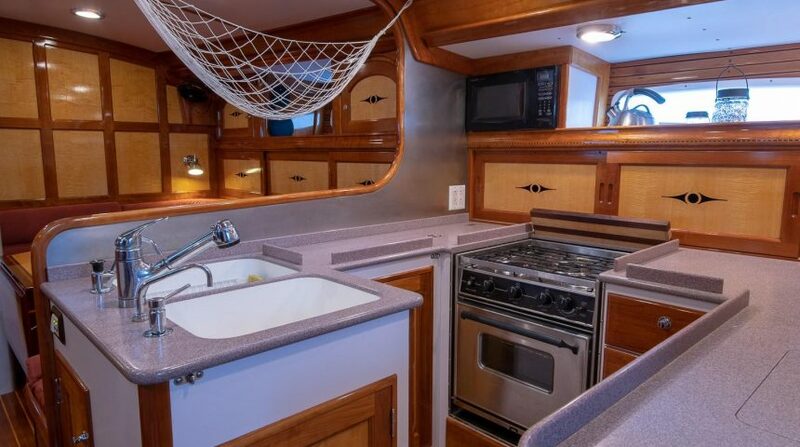 Alpine 12 disc CD changer. 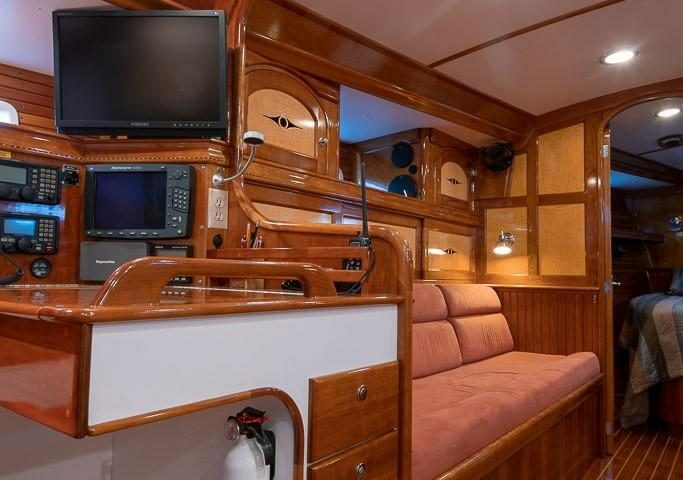 DVD Player (feeds forward stateroom TV and monitor at nav station). 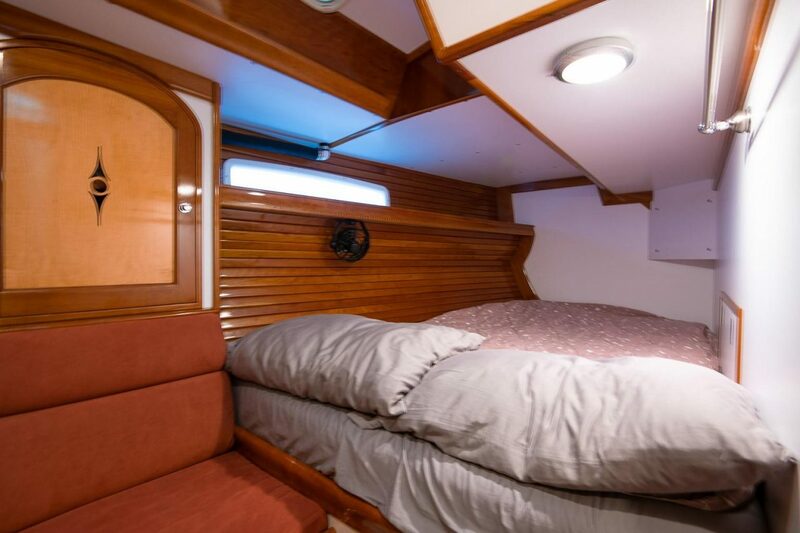 The large engine room provides excellent access to all systems for maintenance and upgrades. 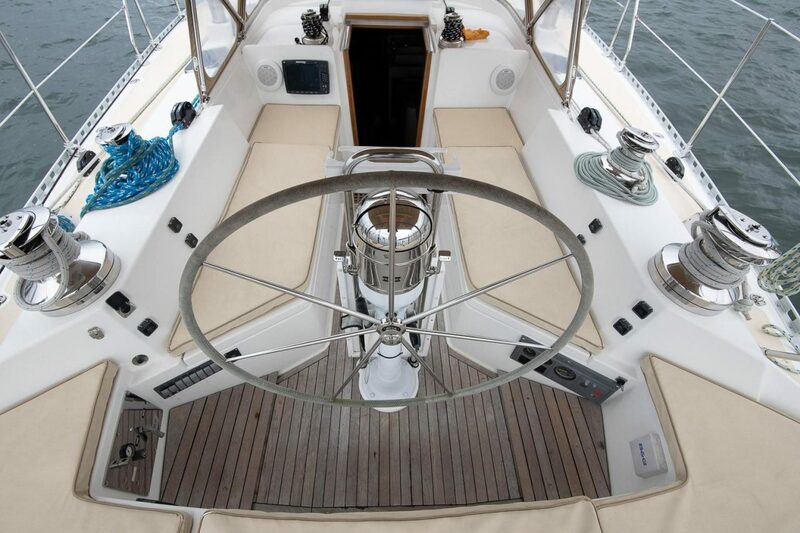 Systems throughout the boat have been installed with high quality materials and are well thought out for service and function. 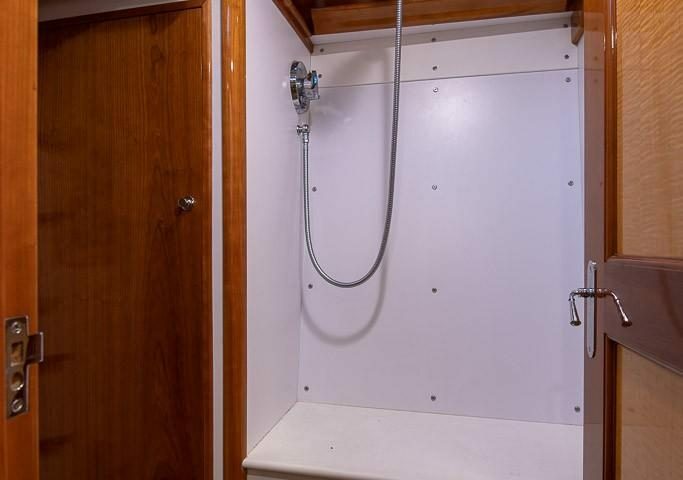 Many systems are upgraded beyond what is normally done by high quality builders such as Morris and Hinckley (such as the stainless steel fuel lines and solid PVC sanitation lines). 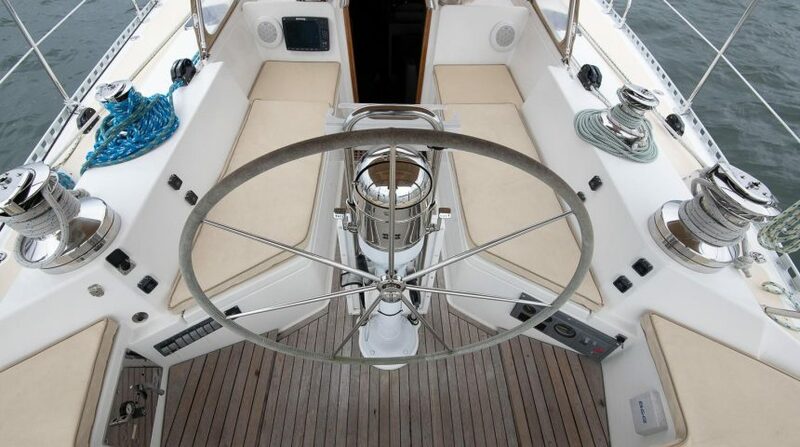 Bilges and system areas are clean and well organized and all valves and systems are carefully labeled. 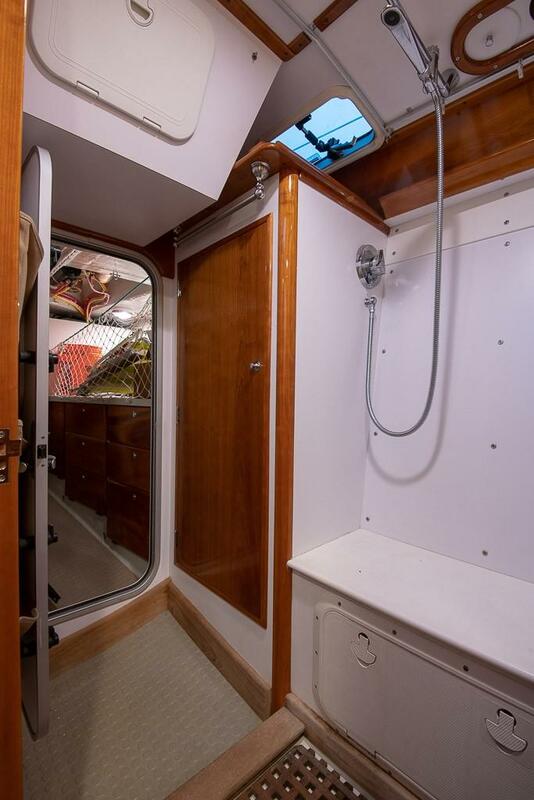 Sea Frost Refrigeration with engine driven compressor and 110v shore assist. 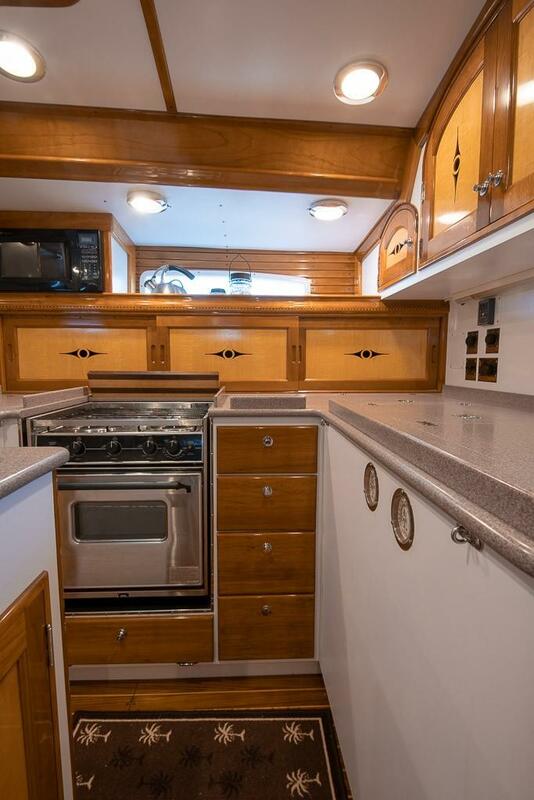 Princess stainless steel gimbaled three burner stove with oven. 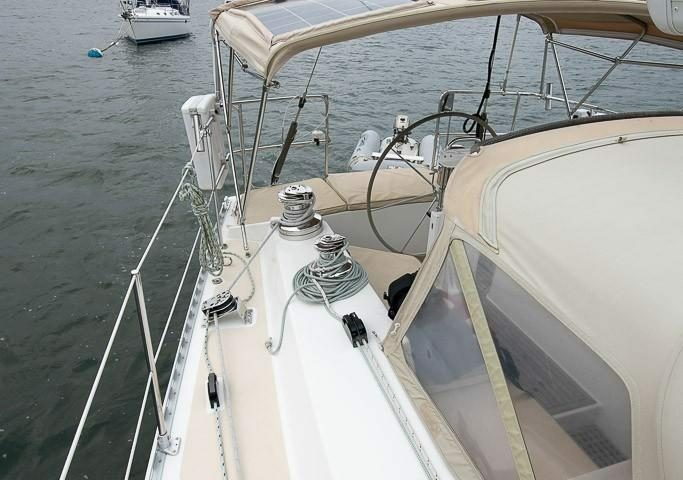 Isotherm HW heater (11 Gallon) shorepower, or engine heated. 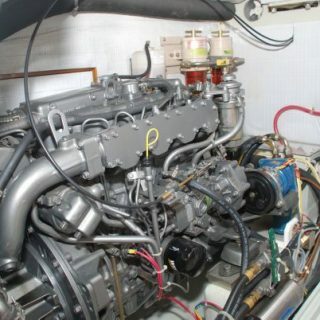 Yanmar 4JH3TE 75hp marine diesel engine (approximately 1375 hours fall 2018). 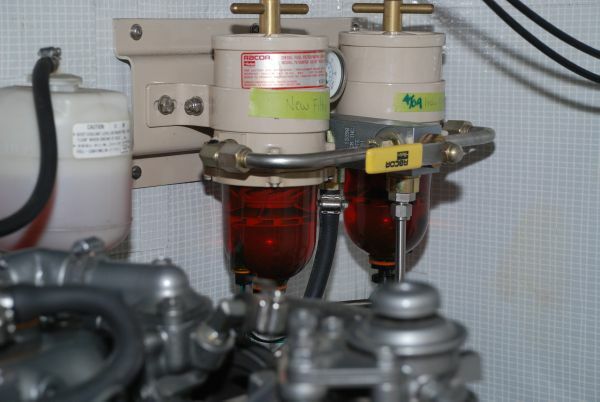 ZF Vee drive reduction gear. 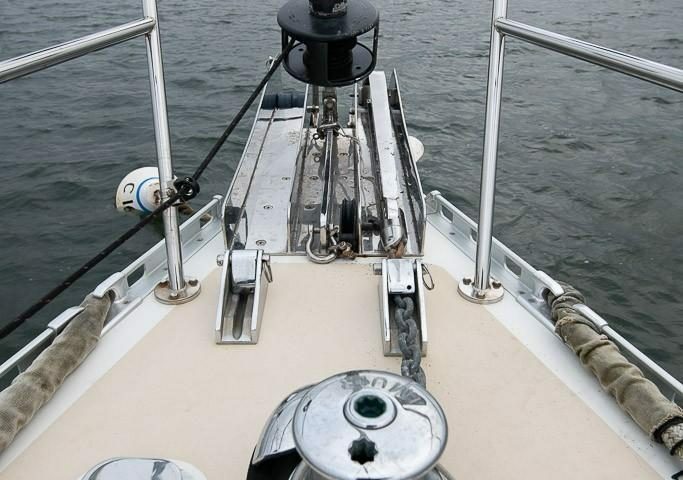 Exhaust system: raw water discharge manifold ducted over by 2" multi ply flex hose transiting through transom through a water lift receiver. 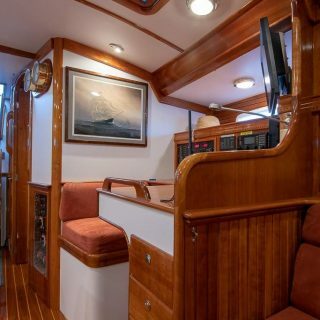 Dual racor filters with water alarm at nav station. 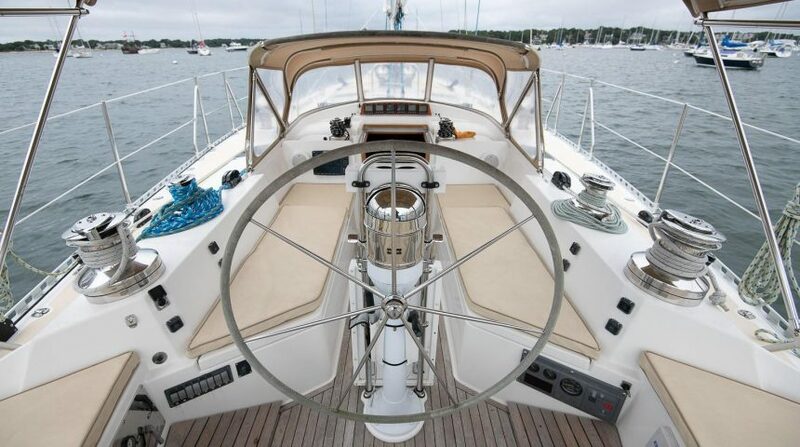 3-blade bronze feathering Max Prop. 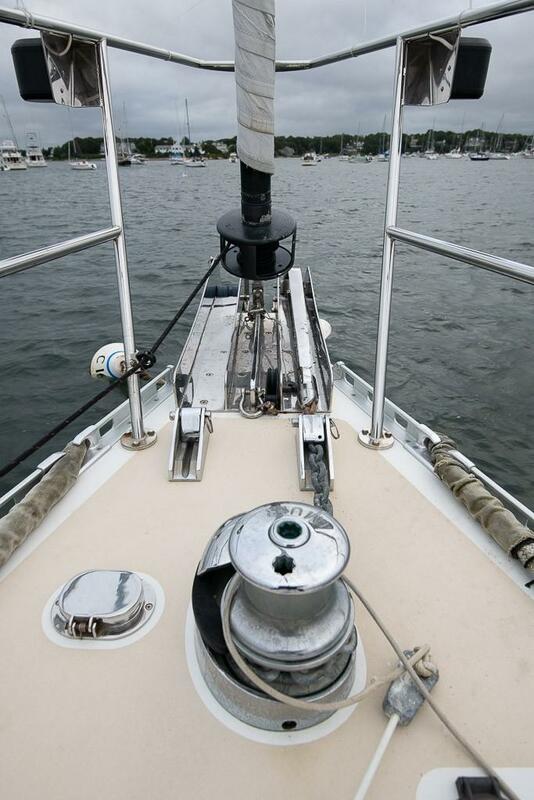 1 1/4" stainless steel Aquamet shaft. 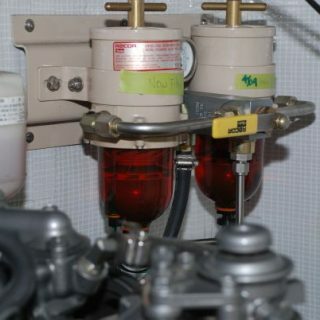 Reverso oil change pump for engine and transmission. 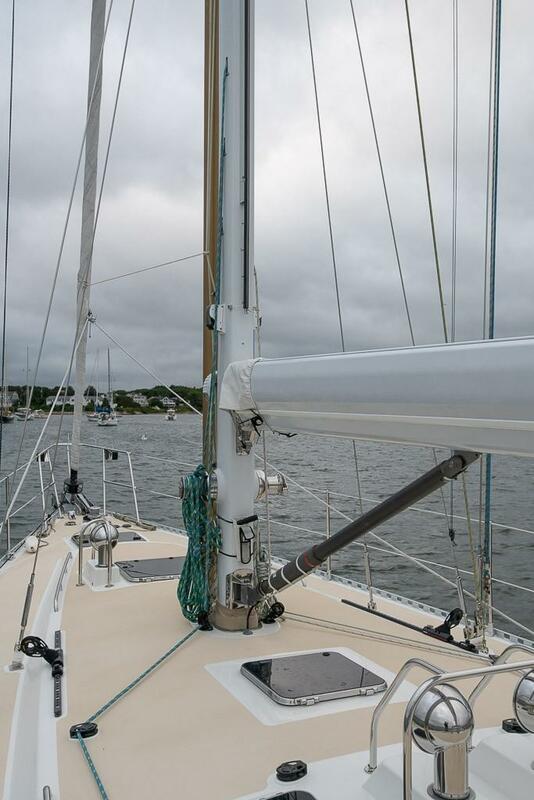 GMT sloop rigged double spreader Carbon fiber mast (keel step). 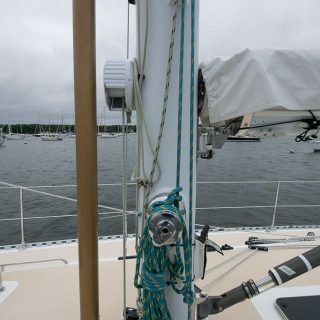 Harken MKIII roller furling for headsail. 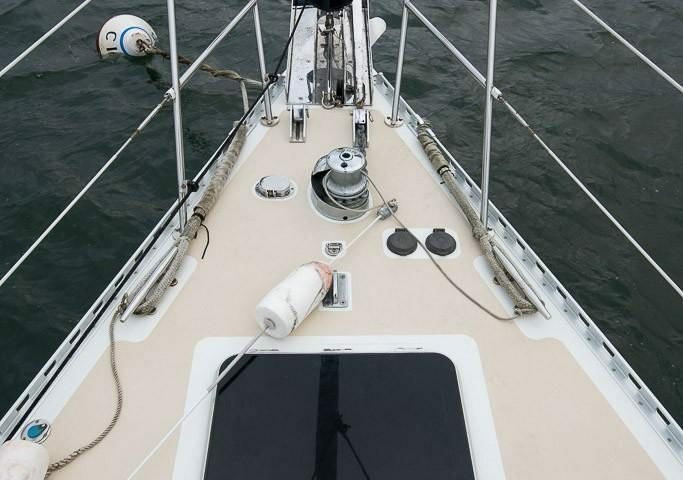 Sailtec Hydraulic boom vang with boom angle indicator. Harding D4 Mainsail Pentex 2008 – Excellent. 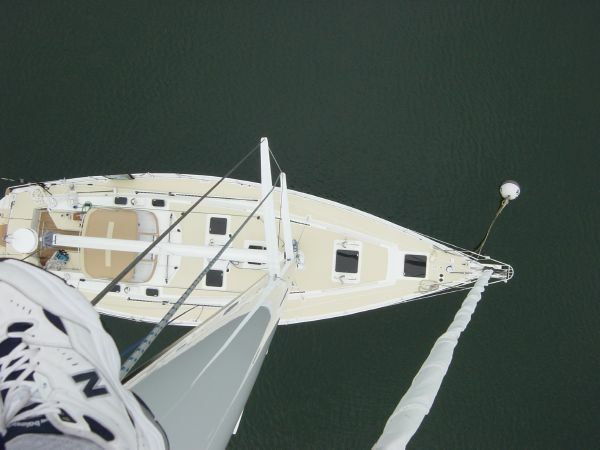 Harding Mainsail Pentex 2004 – Good. 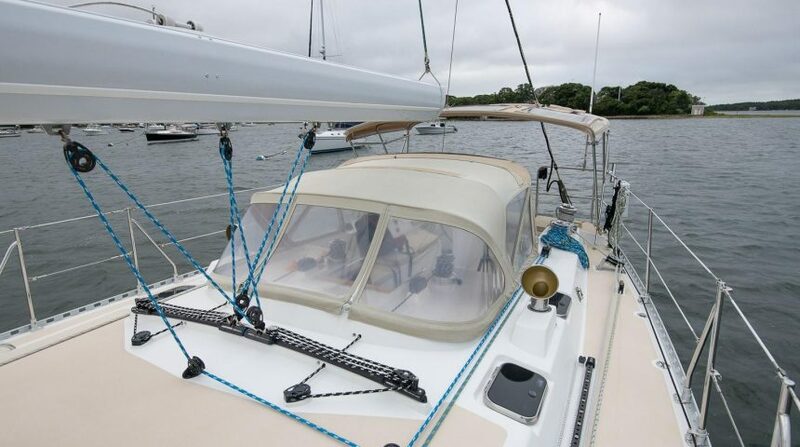 Harding genoa 150% Kevlar 2004 – Excellent. 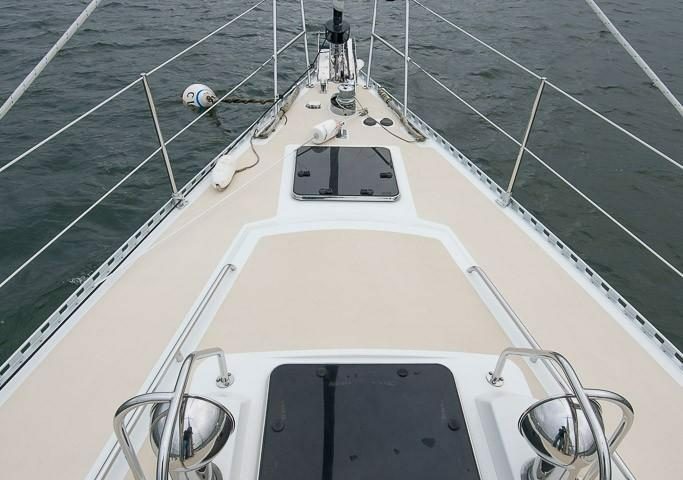 Harding genoa 135% Pentex 2004 – Good. 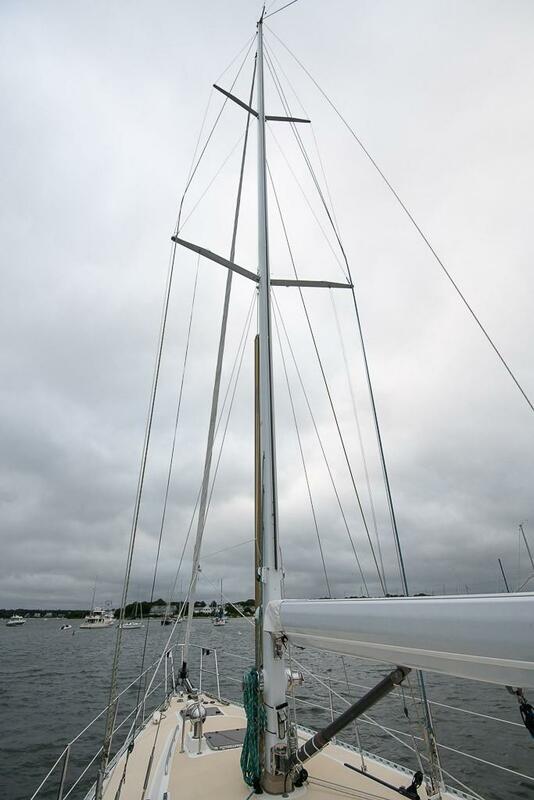 Harding jib 100% Pentex 2004 – Good. 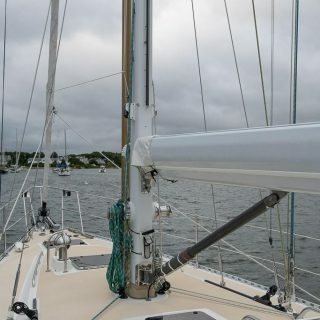 Harding heavy weather jib – Like new. 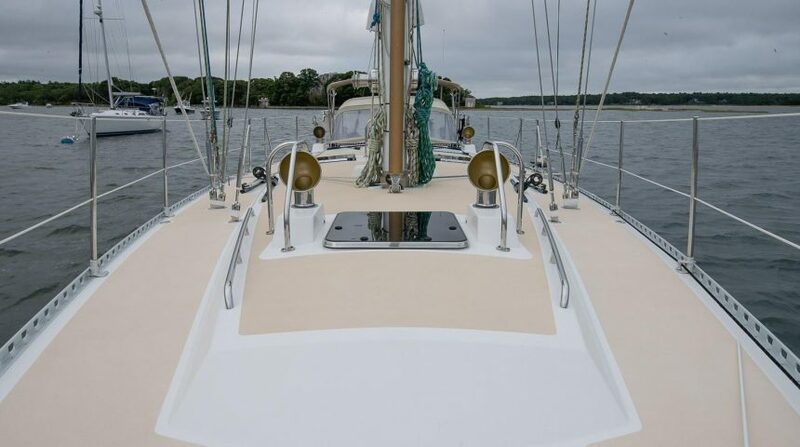 Harding storm staysail – Like new. 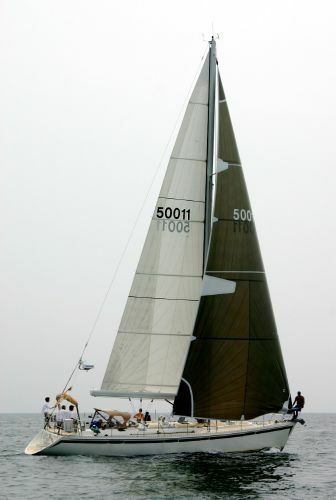 Harding Asymetrical spinnaker 2004 – Excellent. 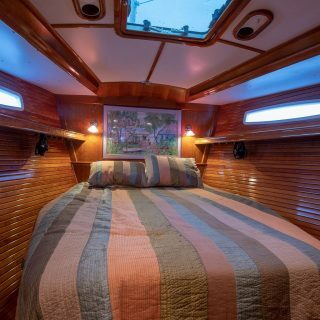 (2) Anderson 68 ST Electric two speed primaries. 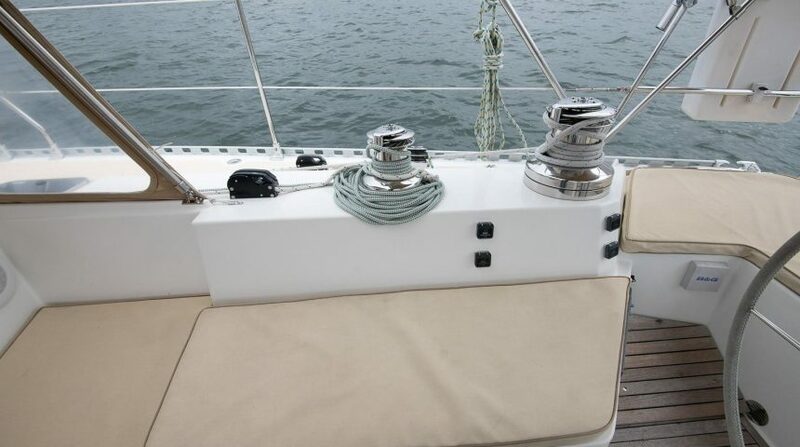 Muir 12VDC Vertical Capstan windlass and up/down foot switches. 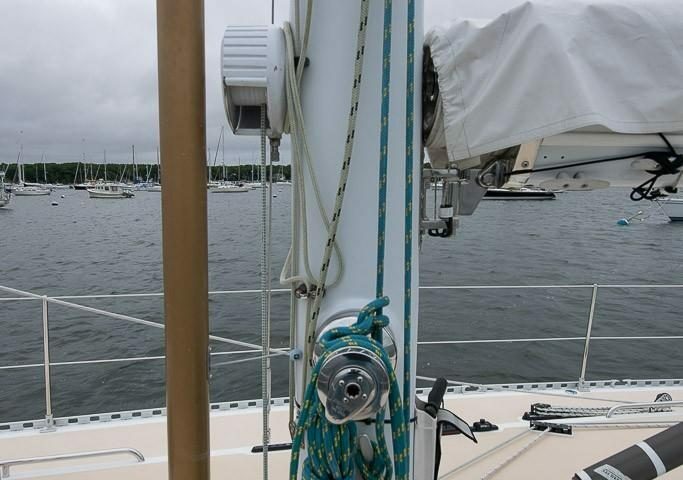 CQR Stainless steel 60lb anchor with 250′ 3/8" chain. 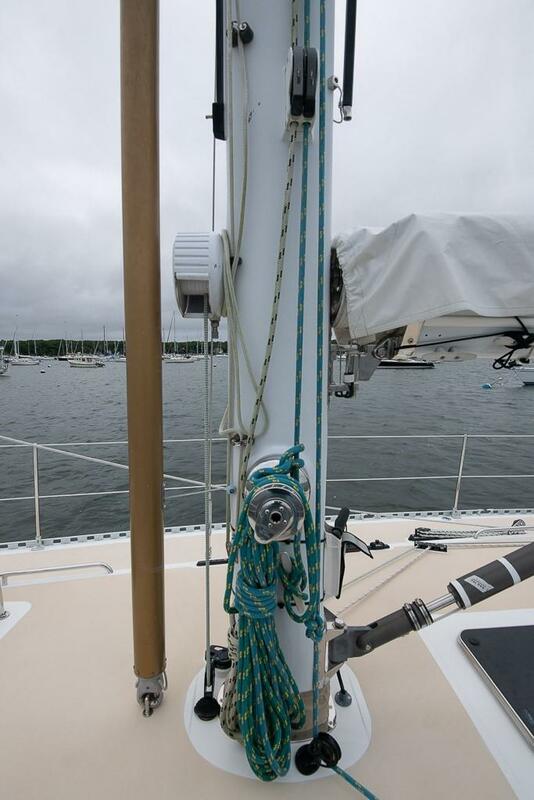 100′ chain, 300′ 3/4 nylon rode. 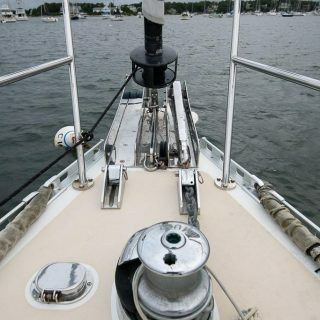 Emergency manual Edson bilge pump. 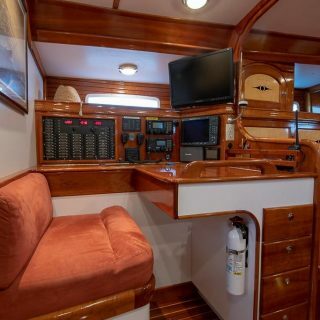 Fire Watch FM 200 fixed engine compartment fire system. 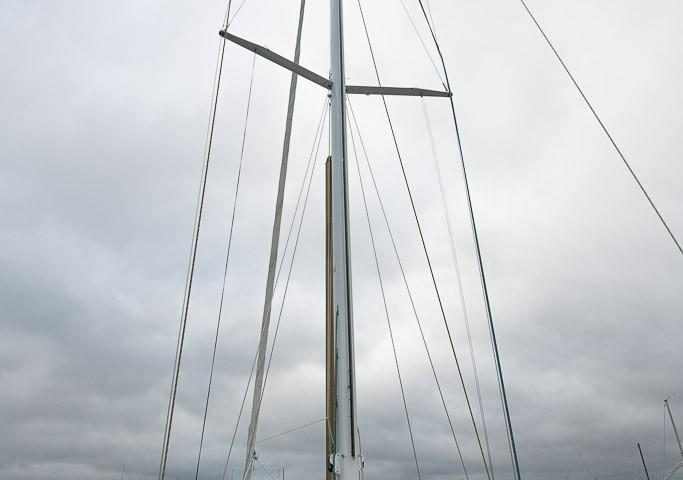 SSB & VHF emergency antenna. 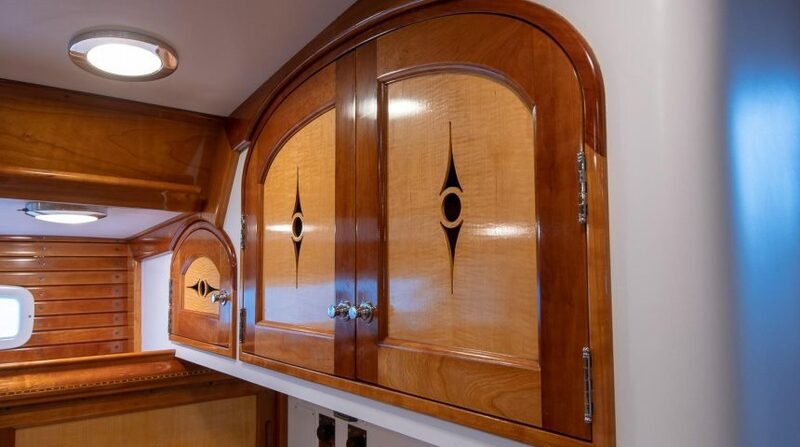 Wood plugs at every seacock. 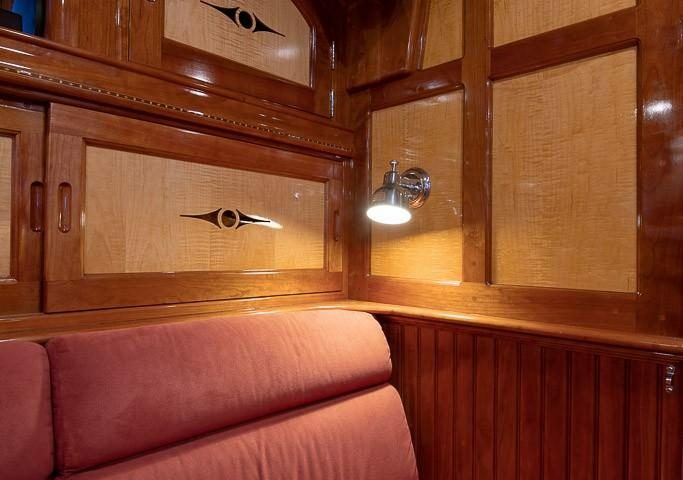 Weems & Plath Clock & Barometer. 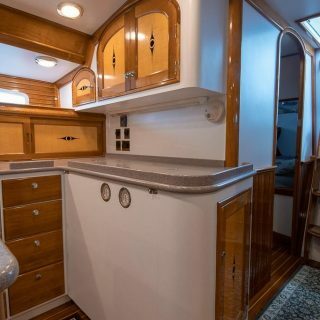 Owner’s personal gear, artwork and tools do not convey. 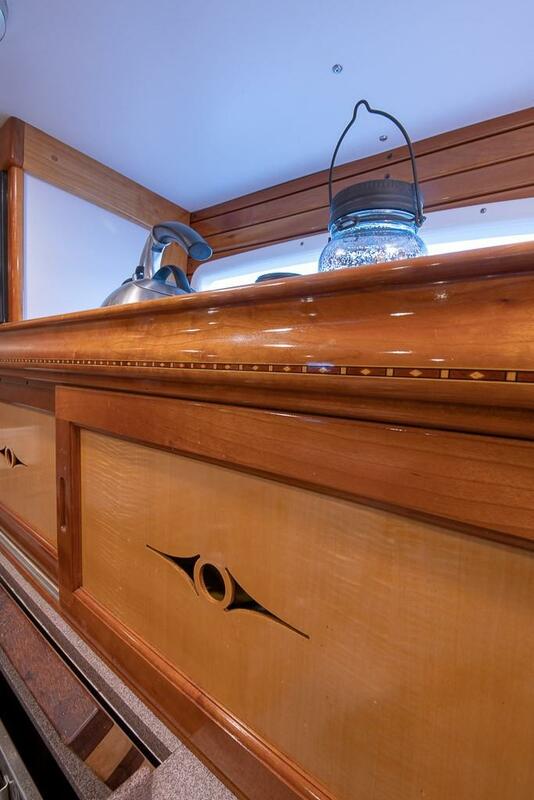 For more information on Eider Down, or any other Morris listings, please contact Morris Yachts Sales Director Wythe Ingebritson at (207) 664-8111 or wingebritson@morrisyachts.com.